Great updates! Looking good. 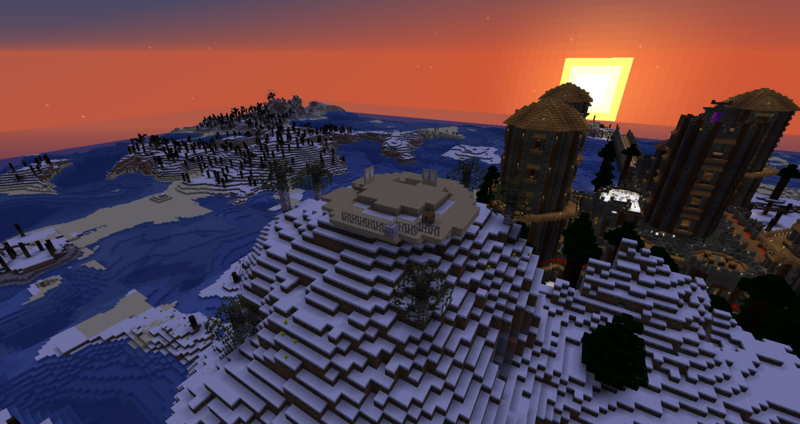 I always appreciate a good survival builder. I've been paying close attention to this thread. Just the age of the world and how long you've kept at it is inspiring. I can't wait for more updates! Currently changed blocks: Stone slabs and stone bricks I have done myself for a long time, Terracotta I have just color picked the muted colours and just done a flat color - I can do texture later. 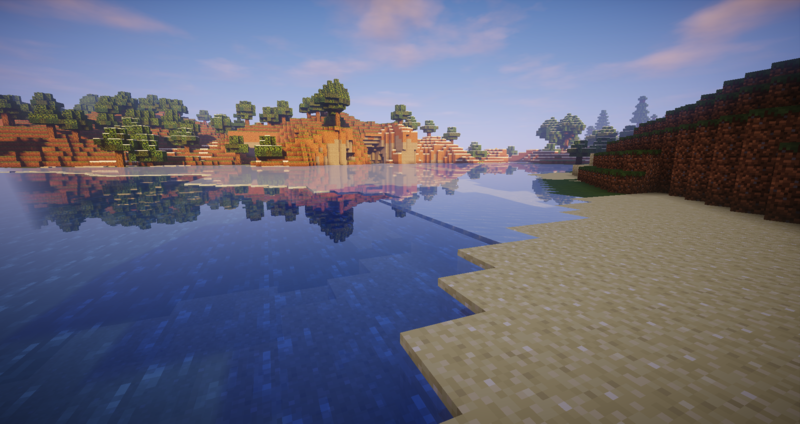 andesite, diorote & their varients still need to be changed, red sandstone & varients I have recolored from default same as coarse dirt. 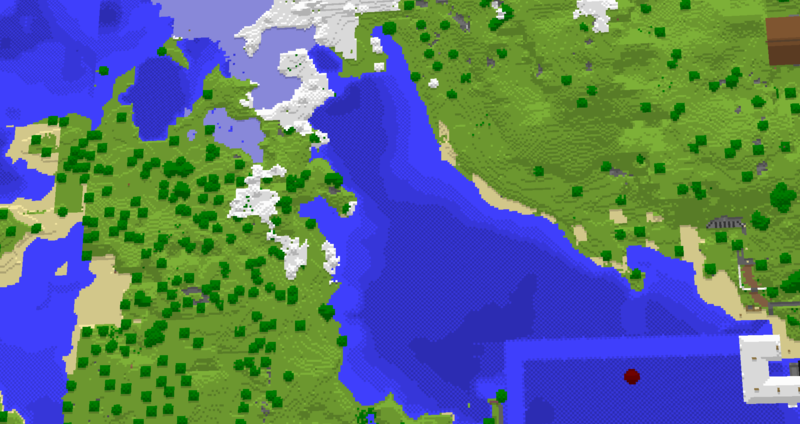 I was doing one of my nostalgia trips - taking a copy of the world and seeing how far back in Beta I could go (1.4 btw), when I got an idea to go travelling in the actual world in a direction I don't think I've gone before. Now, I've gone south from my main home shoreline, but I don't think I've ever gone in that direction from the back of Mount DOOOooom. 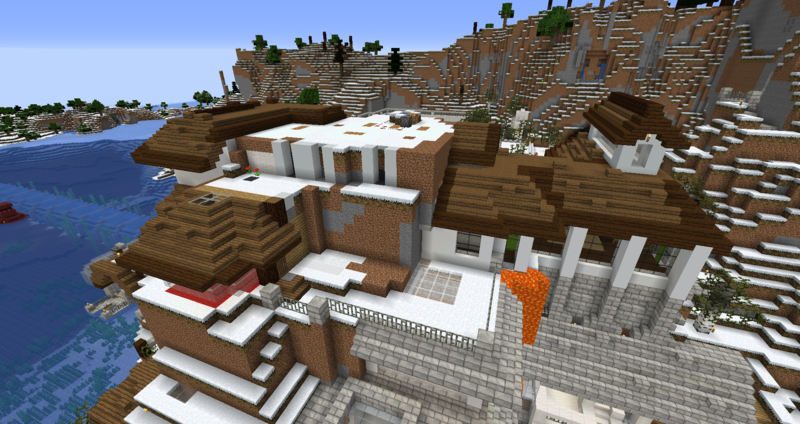 North would across the ocean from the back of Mount DOOOooom, across the bridge to the multiplayer house shrine. So in Beta I found a good amount of clay on the way to the desert I had to initially cross, and it was still there to this day! 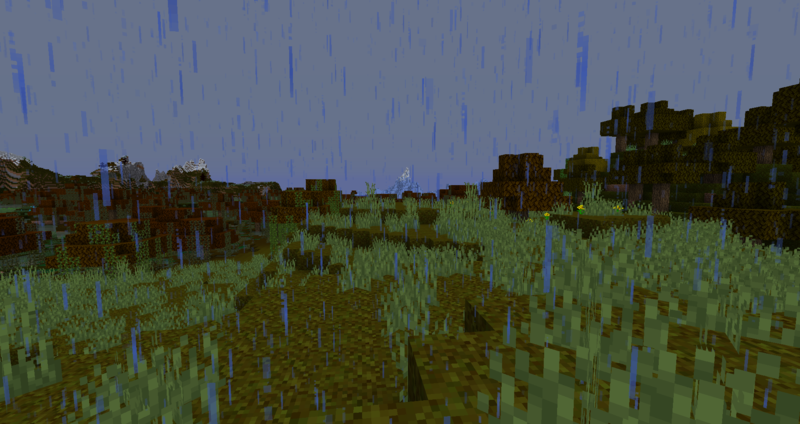 In beta, after the desert, was lots of plains, in modern day - lots of forests and eventually a dark oak forest. As I was going past a mass sand mountain something almost escaped my eye! I thought I saw cobble!, and I know it wasn't me who put it there! The loot was a bit meh, but it was nice to find it anyway. 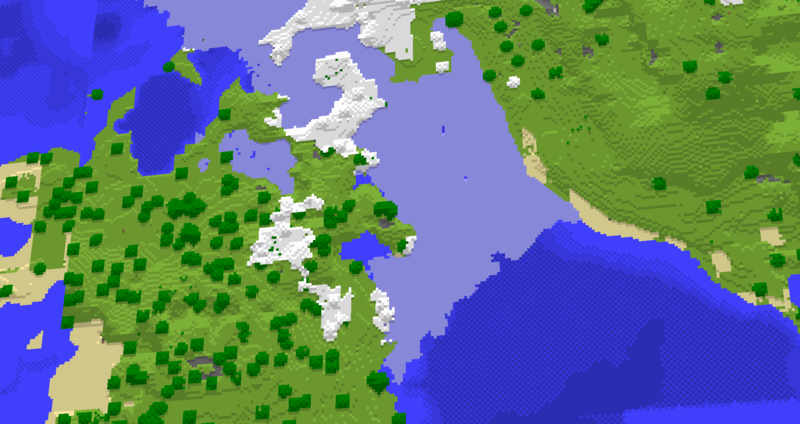 Like I said I found lots of forests and a dark oak forest, also a very strange chunk border with a very small Jungle! I was about to give up when I saw something peaking in the distance. Iceberg, right ahead! 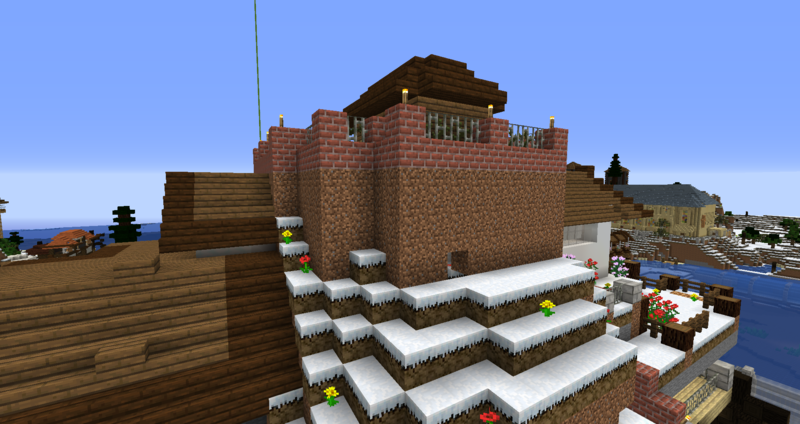 I had found icebergs in my eight year old world! Settling on one particular iceberg, I spent the day and night gathering up blue ice with my silk touch pick. I also slept the night there in case I died, which was fortunate given what I had in mind after all the exploring in that area I did. I decided I wasn't leaving until I got my trident! Death did become me however. With normal drowned I got into a very routine motion under the water of swiping them and knocking them back, then swimming up to them and repeating. 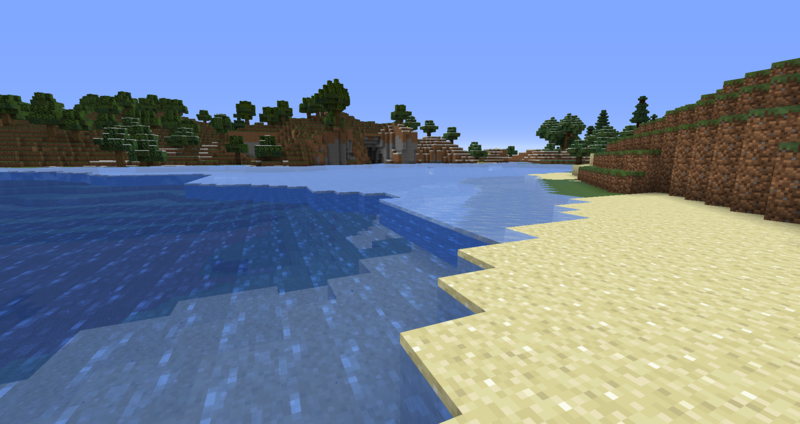 With the drowned with tridents however it was more block, (With the shield), swipe, block, swipe etc.. The first two times I died though, and many holding tridents never dropped them. They say three times the charm and on the third series of tries, he dropped his trident! I was left with half a heart it was that close, so I almost met my maker again - but I got him and I got my trident! So far it just has mending and loyalty on it. 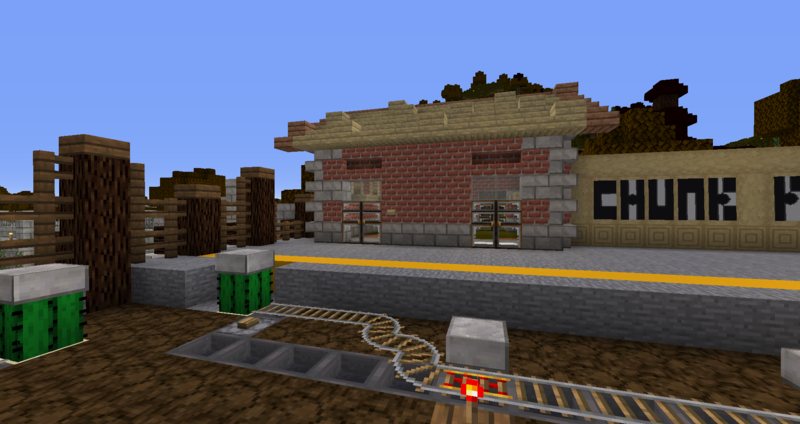 Once home I gathered my brick blocks and began my small, modest little build on the newly opened Chunk Plaza station. It's a W.I.P. but I feel the front is a little flat, maybe I should have another fake window like round the back? 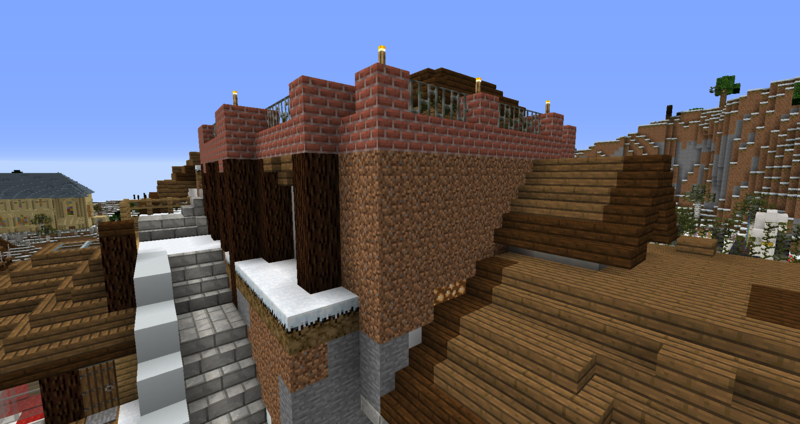 For the first time also I varied my roof, using slabs instead of stairs and using full blocks here and there to add variety. 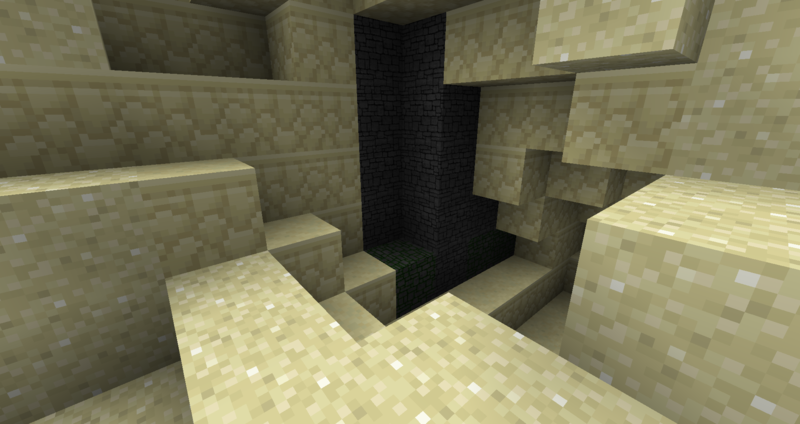 I think the stone-brick ones still need a variant color, maybe mossy stone-brick stairs/ston-ebrick, or something else, but this might have to wait until 1.14. Perhaps a smooth stone slab under-hang also. Inside I stripped the giant dark oak beams too, and gave the windows inside window sills. There was also the little stone-brick bridge by the Chunk Plaza, it never went all the way back to the edge of the chunk wall which was remedied with an arch underneath that went through to the mini reservoir thing. More recently though I started adding the odd stone-brick stair to the flat sides creating little pockets, and mixed in a few mossy stone-brick and cracked stone bricks here and there as well as vines and reed and lily pads in the water. 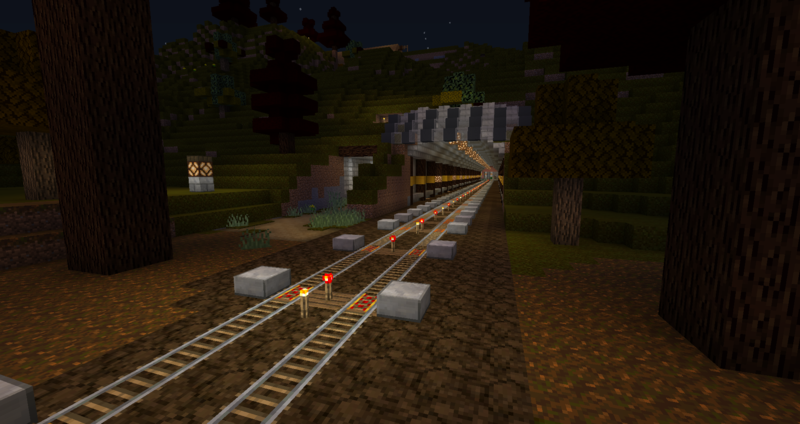 I have also built the same glass/concrete roof shelter above the other end of the minecart tunnel by Chunk Plaza Station, since this photo however I have built it all the way across. I also transformed the empty space above the iron farm into a mass farm, and moved the villagers up there - and it still works , iron golems still spawn and they're breeding like mad up there! 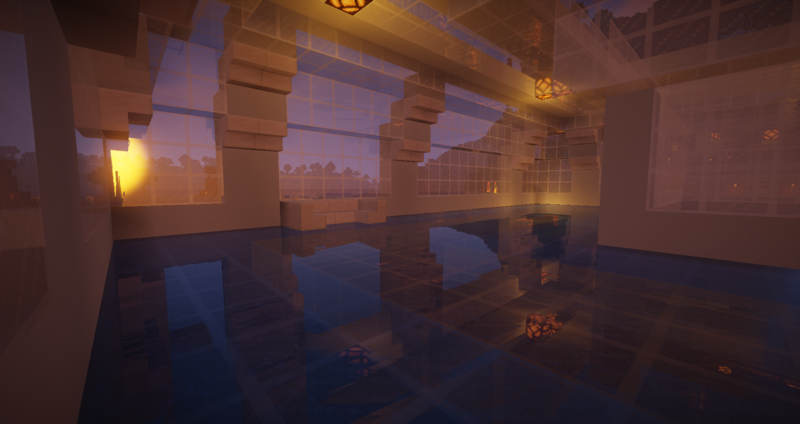 The dirt beams and lighting are temporary - they will be proper beams and hanging glowstone. It took a bit of along break but is very much back in progress! Last time I was on a section where the x co-ordinate had to get to -1095 and I left it at -700. On Sunday I took it to -900, on Monday I finished it off at -1095, on Tuesday I did the next short tunnel and on Wednesday began the next corridor which is another long one - from X -11XX to -15XX something. 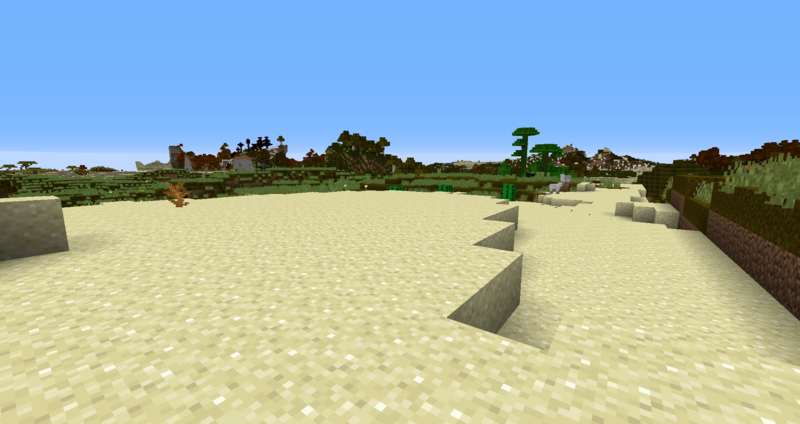 After that, I have one more corridor to do and I'm at the mesa! I'm nearly at the mesa! but gold is still short in supply. 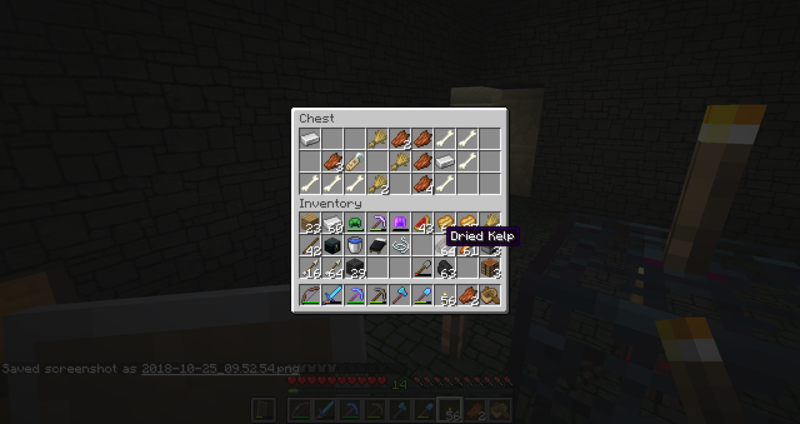 After losing my sword weeks ago (There was a breach at my main mob grinder and in panic at the outbreak of mobs I accidentally chucked my really decent sword - with mending also; at a creeper which blew it up), I went through my mending efficiency shovel now - because I wasn't paying attention! Although I should be close to getting a new one soon but am not looking forward to the grind of villager trading for that mending book. I still don't have enough decent books for a decent sword either. That's pretty much it for now! 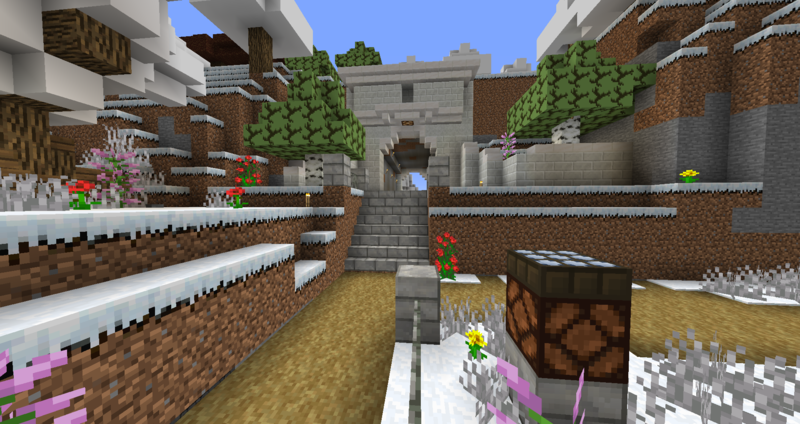 The latest world download for 1.13.2 is now live, see page #1. Currently changed blocks: Stone slabs and stone bricks I have done myself for a long time, Terracotta I have just color picked the muted colous and just done a flat color - I can do texture later. andesite, diorote & their variants still need to be changed, red sandstone & varients I have recolored from default same as coarse dirt. Since my last update on my blog, I have been fairly busy, some weeks I've only been playing lightly; others more heavily. 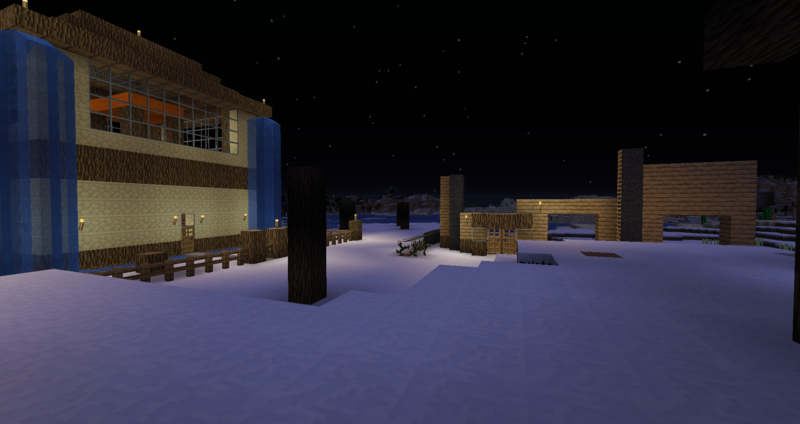 Whilst overseas from Mount DOOOooom at my Multiplayer home shrine (A re-creation from one from the Beta era), I became inspired to build some of my other multiplayer homes from long ago as well and create a little village. This comes about after finding a nice server to play on and over the last month I have been gradually playing more Multiplayer than I was - which was non existent. 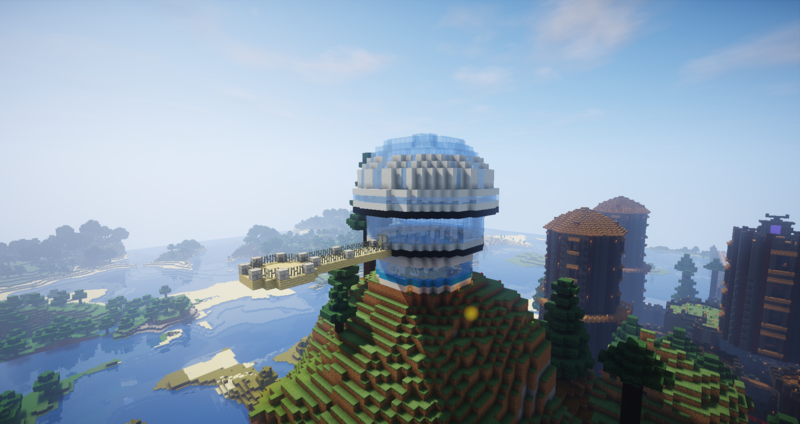 Eventually I will build my current home from this server as well, but right now I'm building replicas of the old ones - not matter how bad they might have been in the past. 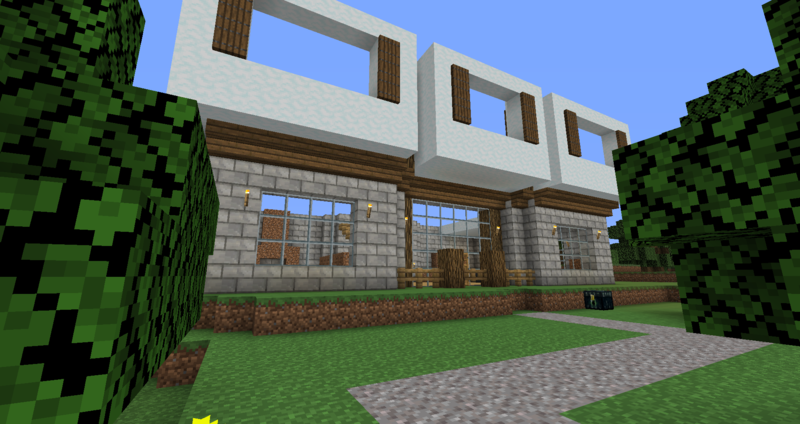 To build the first one, I of course had to demolish the old wheat farm that had been there for many years, but it was very basic so it was no real loss. 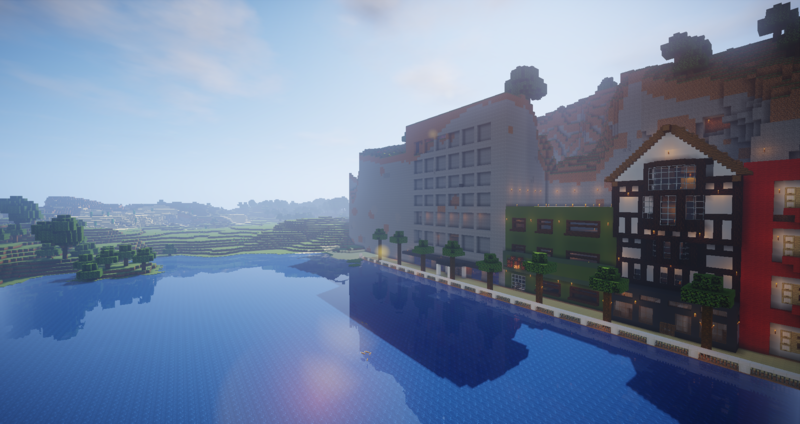 The second home is one of my favorites and happiest times on multiplayer, on a server I was very happy on for a long while. I also restructured the top of the bridge from Mount DOOOooom to the multilplayer shrine Island (As it will now be known, now there will be multiple buildings.) 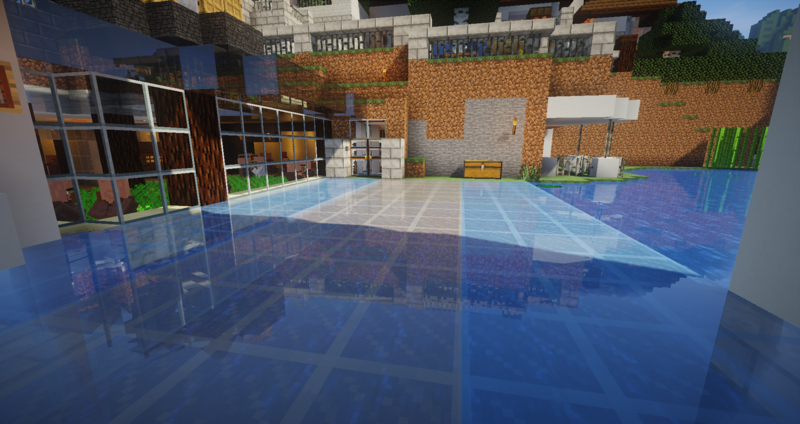 Originally it featured cobble slabs bit it didn't look good. It still needs work. 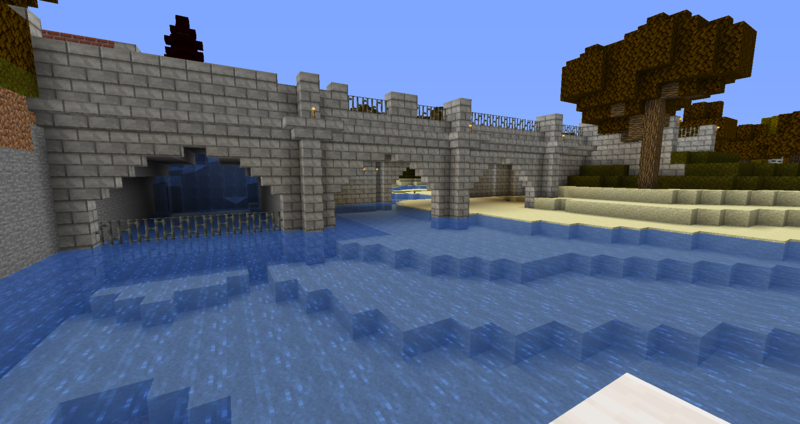 I also thickened the columns at the side of the bridge. 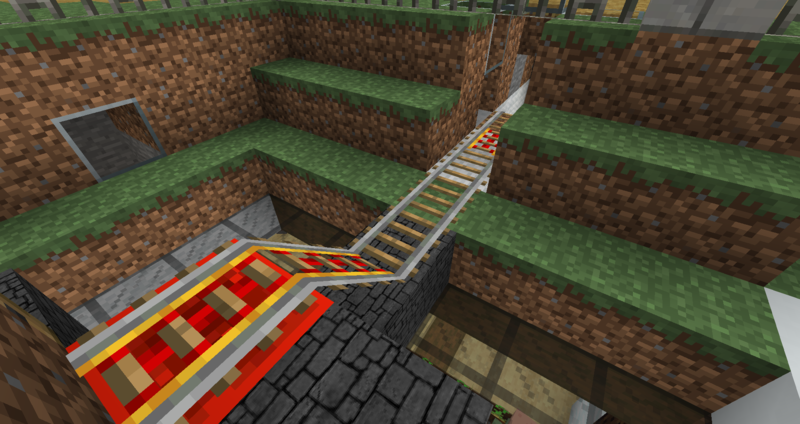 I have also been grinding for gold for the powered rails needed for the tunnel to the old mesa biome. 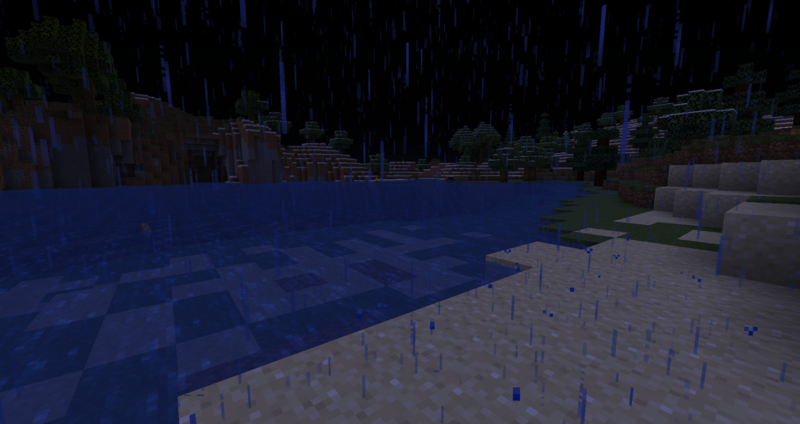 I didn't make the one with all the obsidian though, I went for the slightly less efficient turtle egg system. 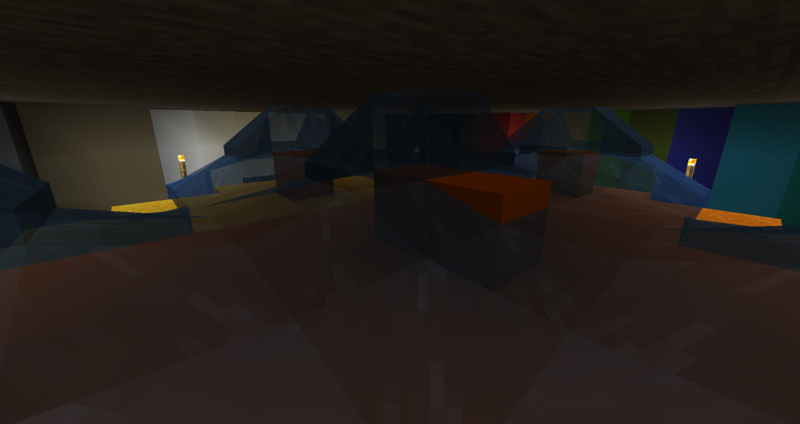 After digging up to the Nether's bedrock level and then up to almost level y=250, I created the platform - completely out of netherrack almost, and made the center hole placing a turtle egg (I got before hand) and plonked it on the single column I had used to block up to that point (With ladders up the nerf pole). There are two factors though. It can be very slow, plus the trapdoors around the edge they are supposed to walk over to get to the egg, they get stuck on occasionally. 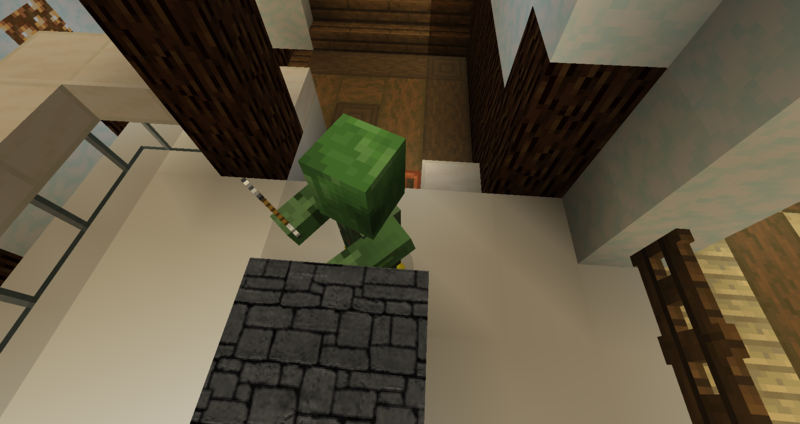 What I found works, after removing the trapdoors, is using a bow to shoot any pigmen lingering on the edge from below on the hopper platform. 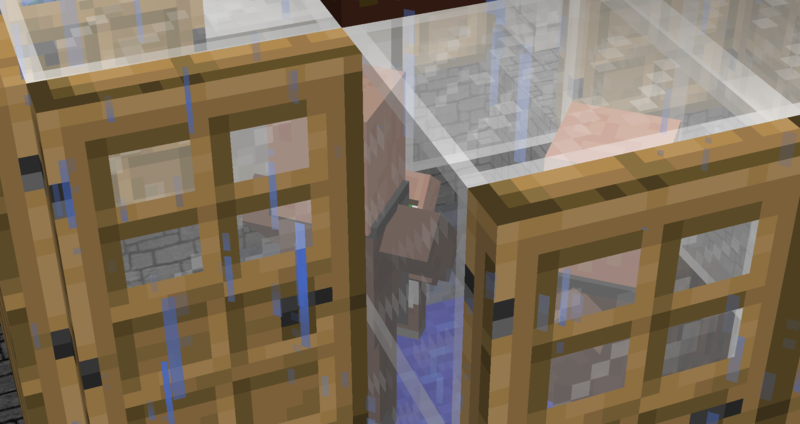 Anger them enough - especially hitting them on the way down and it literally rains pigmen. 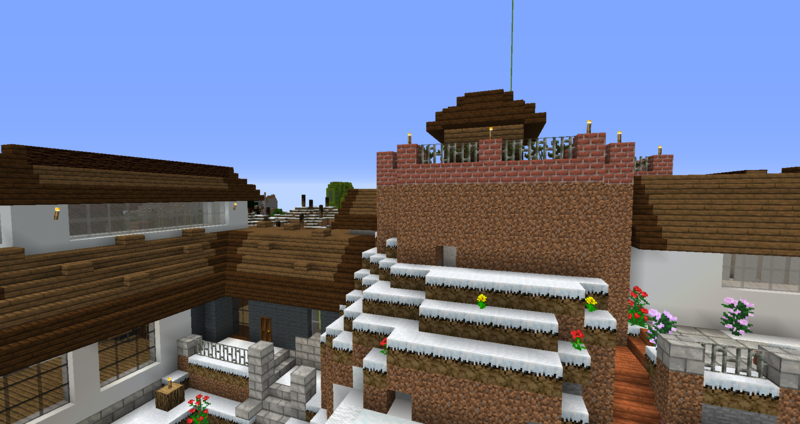 I also have a netherrack shack (Which only leaves one block to stand on inside behind a fence gate) to fall back in to. Today I got over 30 xp levels twice (40 the first time and made a Unbreaking II/III/sweeping edge II, Bane of anthropods II spider sword - even if it is gold, and enough xp on go #2 to repair it fully. 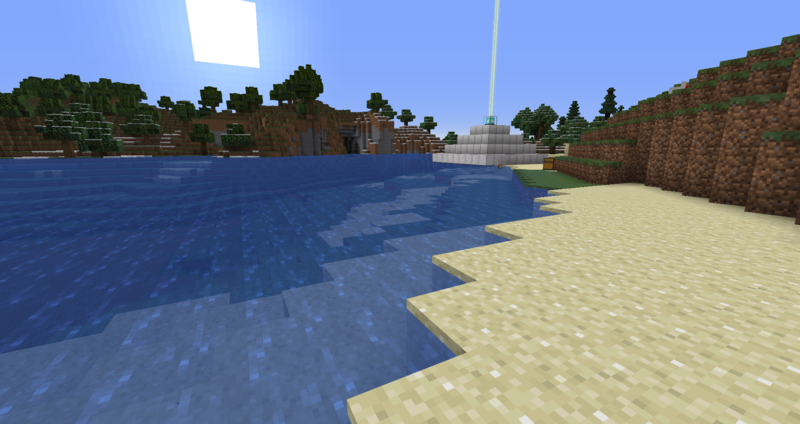 Today after finding out the egg in the gold farm was gone I went to get more and traveled back to the 1.13 chunk again. 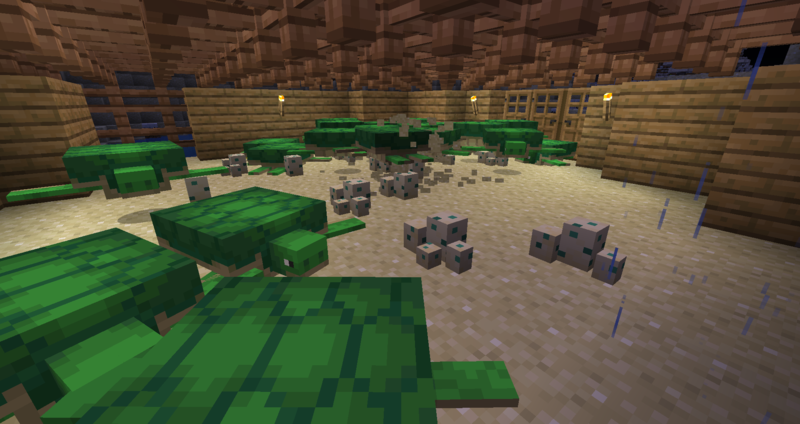 I bred every single turtle there and waited for each egg to hatch and grow - apart from 2 eggs left. With each generation that grew up, I set a load free back into the ocean but to get down to those 2 eggs left it took many in-game days of waiting and growing and collecting (Scutes). I will return for the last two eggs eventually and when they've grown up I will set all but two turtles free. 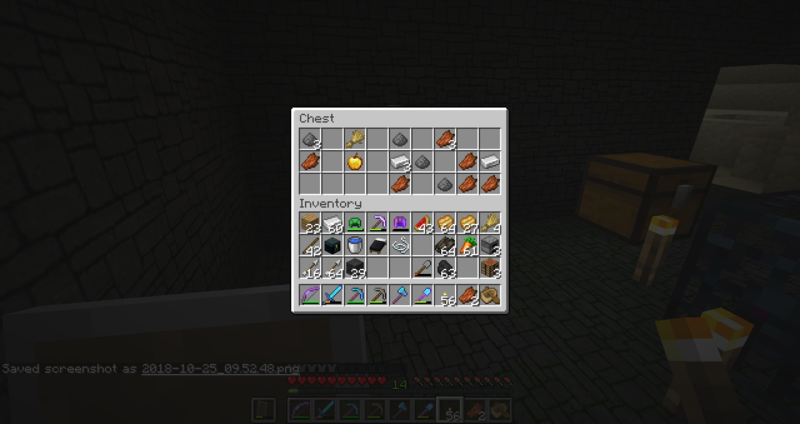 I got just over a stack of scutes approximately enough for 12 helmets and spent a bit more time at the gold farm. With setting each generation of turtle free - the nearby lagoon is packed with turtles now. As of earlier when I got off before this post I now only have 1 & 1/2 lengths of tunnel left (To the mesa) to finish with power rails for the base line. I completed all they way there and had done 1/2 way of the return trip, but by the last session before this post - just 1 & 1/2 lengths of tunnels left to put rails down on. 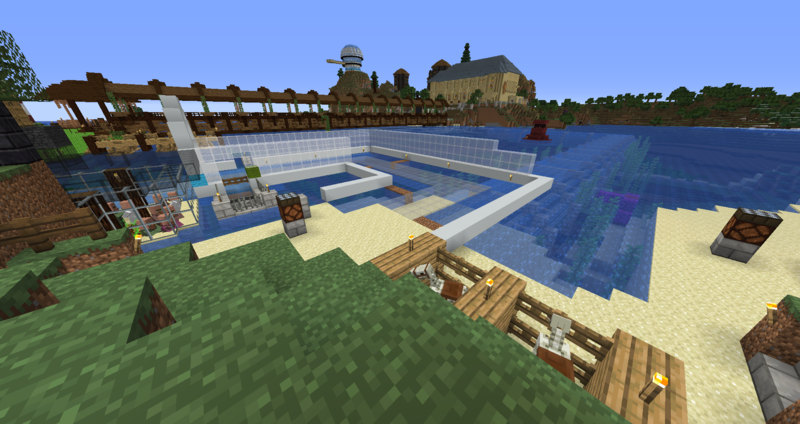 I'll probably do some more building to have a rest-bite from the turtles and and rails and gold grinding, perhaps continue the current multiplayer house I'm working on re-creating in this single player world. 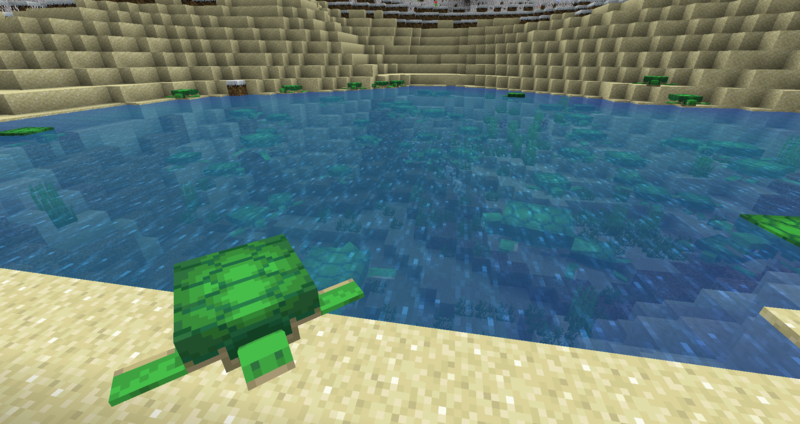 Turtles... you've reminded me that I have yet to update from 1.12. You can use them to make a gold farm? Something else I've yet to accomplish, and now I wonder how many ways there are to do so. I've considered doing the platform in space approach, but I've also seen some users who create overworld obsidian portal farms. Do you have screenshots of this turtle approach? Still drafting ideas... but, turtles are not yet on that list. 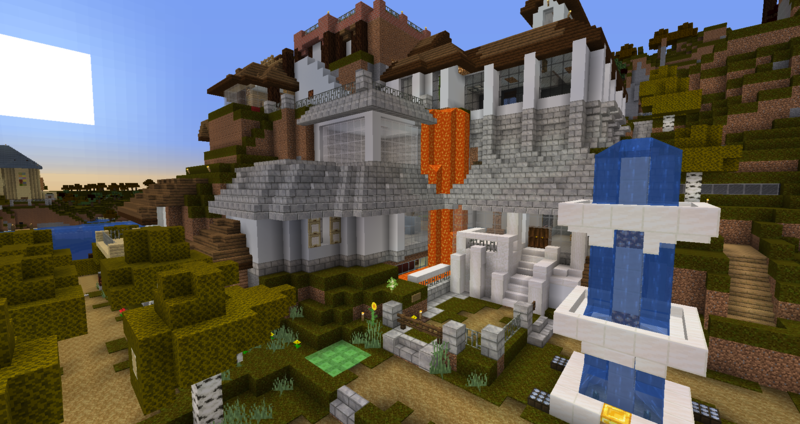 Side note: I haven't played multiplayer in at least four years, but I imagine that by finding the right server, the experience of building with others can enhance one's appreciation for the artistic possibilities in this game. Do you find this assertion somewhat accurate? I recall only one private server that I played on, many years ago, that was ultimately shut down. 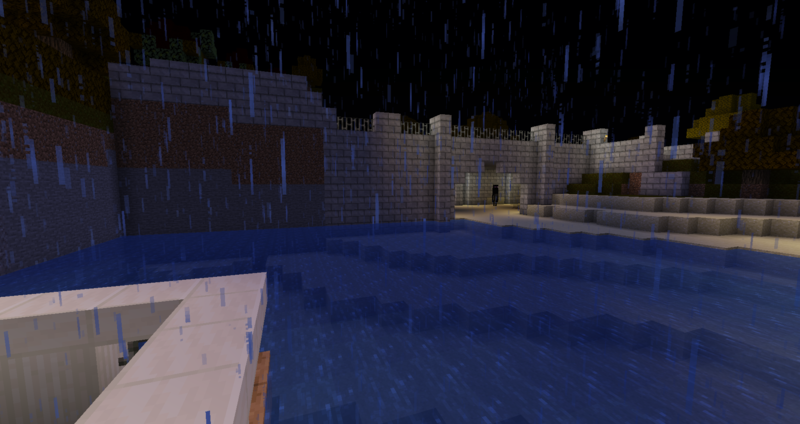 I liked it at first, but too many command blocks started to take over survival and compromised the experience for me. Maybe I'm just an old soul. For the multiplayer stuff - sometimes. On one of the old ones mentioned (Where I was happiest) I would say so. I stopped for years because of all the pvp/mini-games dictated servers, i'd rather bi in a place where I can help build and share experiences, it's fine to be into the other stuff - that's just not me. Due to this I really enjoy the Hermicraft Youtube series which I only found last season. 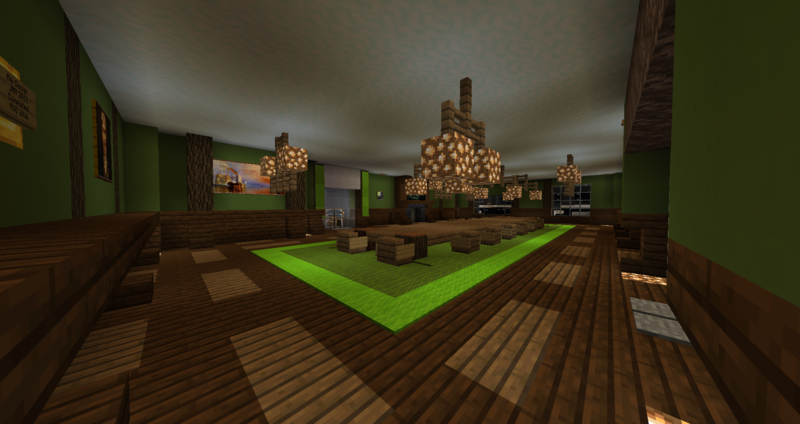 I highly approve of this change, and would like to complement you on the stylish ceiling work! 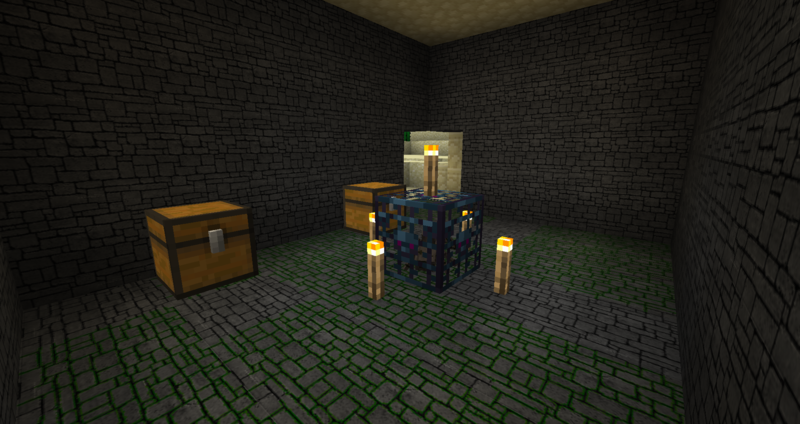 Glow stone is so large, I think end rods and torches make better chandeliers. Thanks! 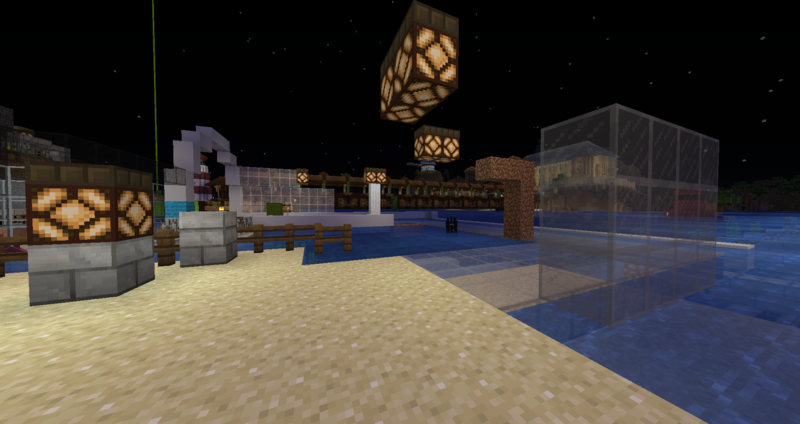 They may change to lanterns when we get the stable 1.14 release. Years ago I raised the ceiling but there's grass and paths on the outside directly above it so I can't do it again as like last time I've have to put another layer to cover and it'll be too much of a build up of land. It'd look funny land wise on the outside. Pre-disclaimer: I meant to put this up yesterday but I copied page #1 into a word document and have slowly been editing in new pictures where required and changing a bit of the wording when needed. IE - no "stairs down to storage" as there are none any more, and generally replacing any pictures I thought needed replacing. Which is now done to keep it fresh. Currently changed blocks: Stone slabs and stone bricks I have done myself for a long time, Terracotta I have just color picked the muted colors and just done a flat color - I can do texture later. andesite, diorote & their variants still need to be changed, red sandstone & variants I have recolored from default same as coarse dirt. I'm not sure where I got the idea from, maybe I've been watching too much Hermitcraft, but - I got this idea in my head to go on a collection mission. 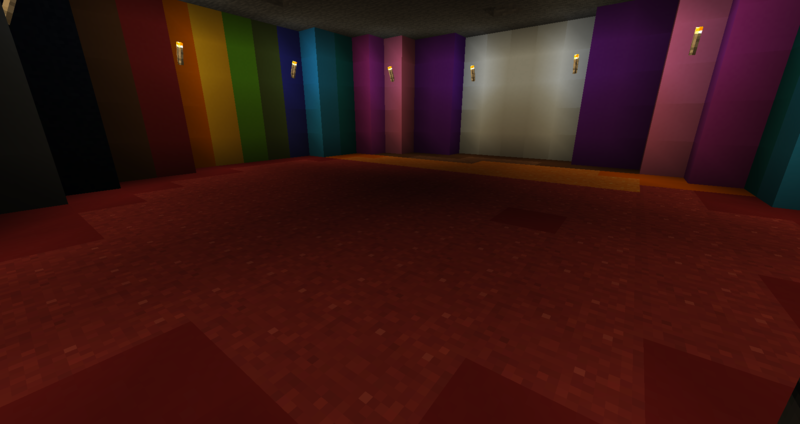 I had this idea in my head to get one of every dye and a stack of sand and gravel for each dye and make concrete of every color! I would take the gravel from storage but taking the sand would leave me a little short, so I went to a desert across the ocean from the back of Mount DOOOooom to collect.With my efficiency IV shovel I easily collected 16 stacks of sand, along with the dyes and gravel both from storage I then realized my error, that I needed 16 of each dye not 1 as it would only going to give me 8 blocks of each color. Correcting my mistake as I went along making the concrete powder I completed the task and converted it into solid concrete, almost taking out my efficiency IV pickaxe mining it back. I also got a similar desire for glass something I always also need alot of, especially as I use a lot of light grey glass which doubles as a substitute for default glass. I would also need some of it for another mini-project I had been mulling over for over a week now. 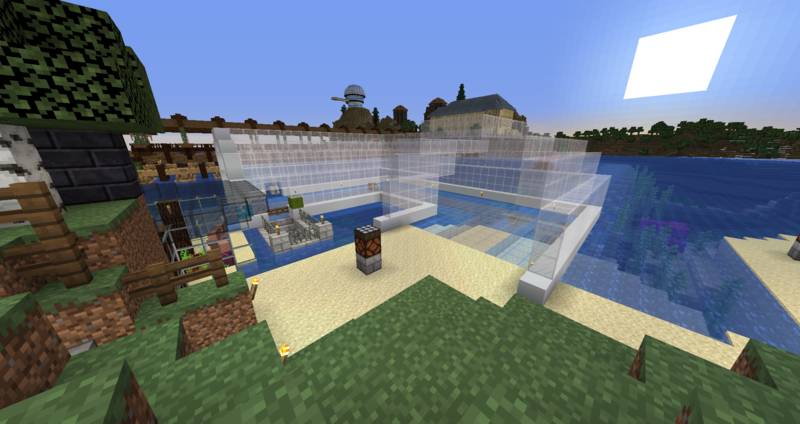 Once again I collected 16 stacks of sand from said desert again and converted it in the kelp fueled furnaces in both storage and the underground food farm. Something that has been bothering me for a while whenever I do screenshots for a "gallery" of the world is discovering the observation platform on Lookout Mountain is made of wool! I NEVER build in wool! The only exceptions are the 3D art of my skin's head and the walls to the bunny enclosure and that's it! 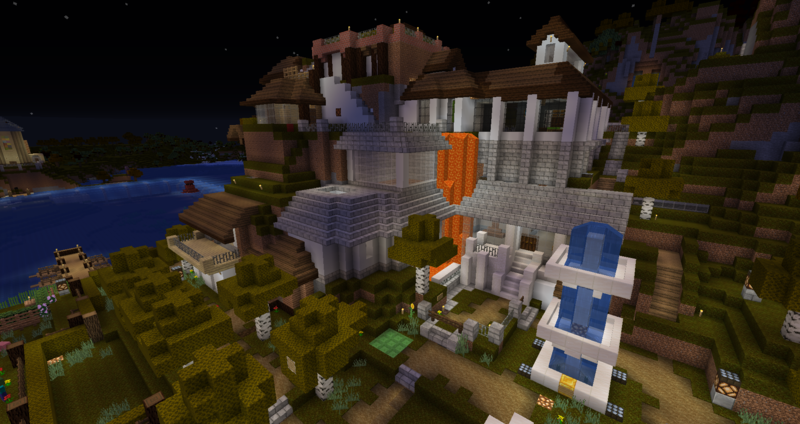 I can only assume when I built it 2 years ago the textures were different and I used the wrong block! So instead of just replacing blocks I decided to tear it down and start again - bigger better and more durable. Mostly the same but with a slightly different top half. To achieve this, I actually took 2 blocks height of the mountain so it was flatter, this would enable me to create a much bigger circle and thus bigger version. The inside was very cramped as it was. Ironically I've now run out of light blue glass and white concrete (Using both the two stacks of powder and 2 & 1/2 of solid concrete). 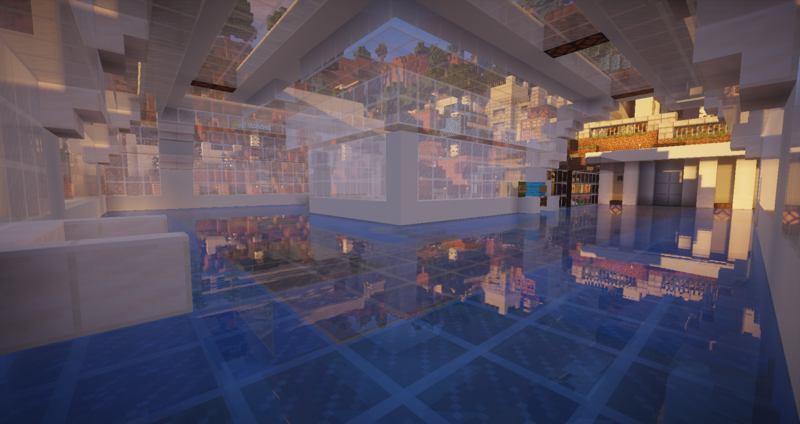 I did re-design this on the creative copy first, but there are some changes, the lower level was going to be a snow block ceiling and changed back to glass like the original building and re-locating the spiral stair way to the upper level. 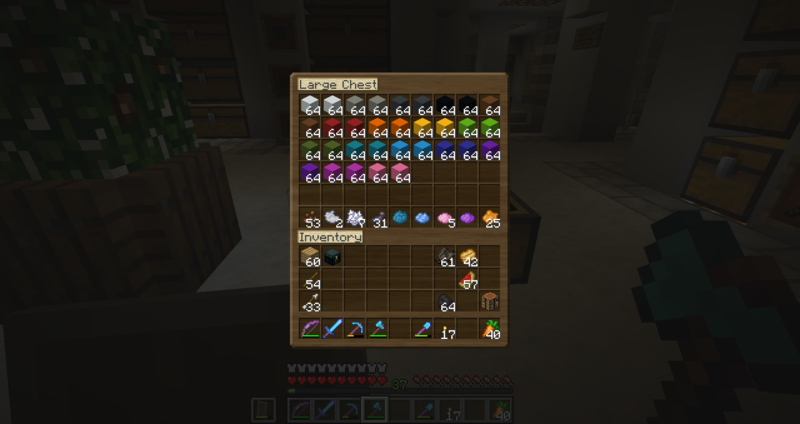 I also took the opportunity to clear some of the melons and pumpkins from their farms to trade for emeralds at my villager far for mending books. As I actually bother to wear diamond armor now I wanted mending on them, first just the helmet and chest plate because the mending villager actually run out! I traded something else and it was enough to renew the mending book trade however so I got mending for all. Apart from the trousers (Projectile Protection IV) the rest only have very basic level 1 enchants - aqua infinity and feather falling, nothing on the chest, but I guess that could change. 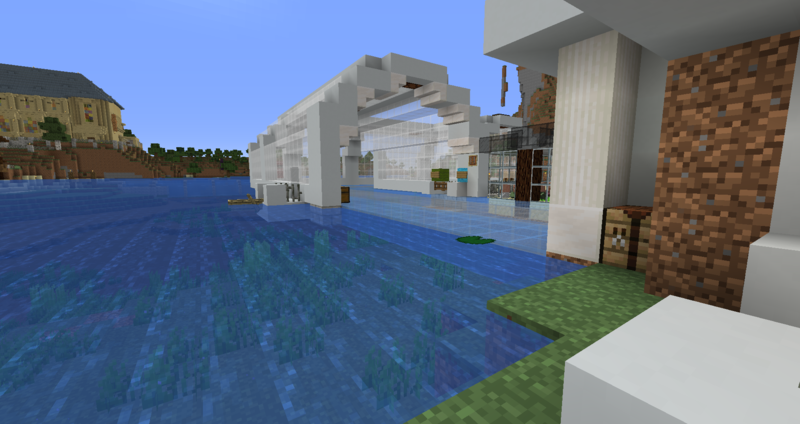 Current location: Glass tunnel, outside villager hall. Leaving off exactly where I was last time I put the last glass blocks of the roof of the new look Observatory platform on Lookout Mountain on Wednesday this week. In the first picture I did replicate the blue stripe in the upper roofing but found it too distracting, after considering grey or light grey (Also after some experimentation on the creative copy!) 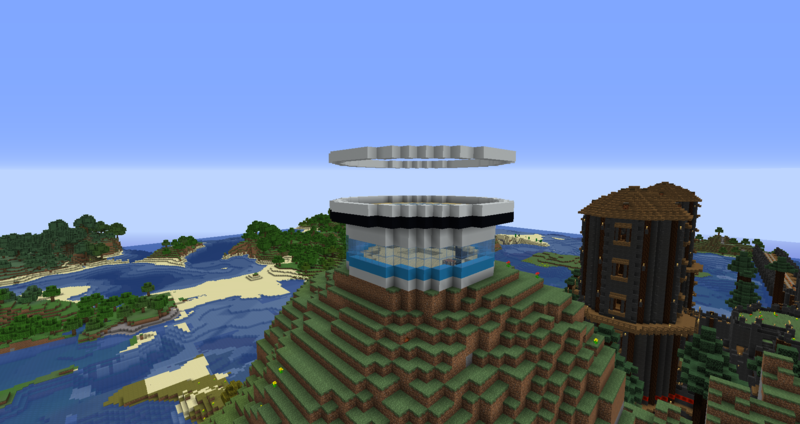 - I replaced it with the same light blue glass as the very top of the roof to let even more light in. For now I'm not showing interior screenshots as this is just the bare bones of the building, inside I will be adding detail with quarts stairs to the upper roof and a couple of beams. 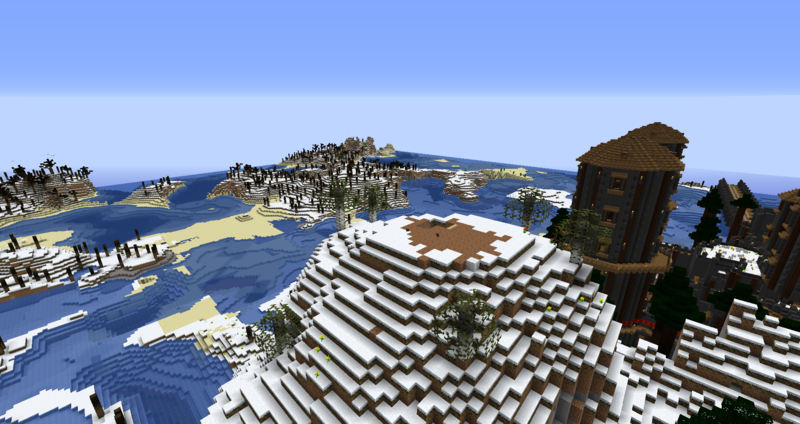 I am yet undecided about having the lower birch platform around the outside of the base like the old one. Then came another project but it was a big one! - or at least it would be a big change for the sky-line. so I backed up in case I did not like what I was about to do. This next one has come about with something I have been unhappy about over the last couple of years - the top of the mountain home. For years it's been a sore point. 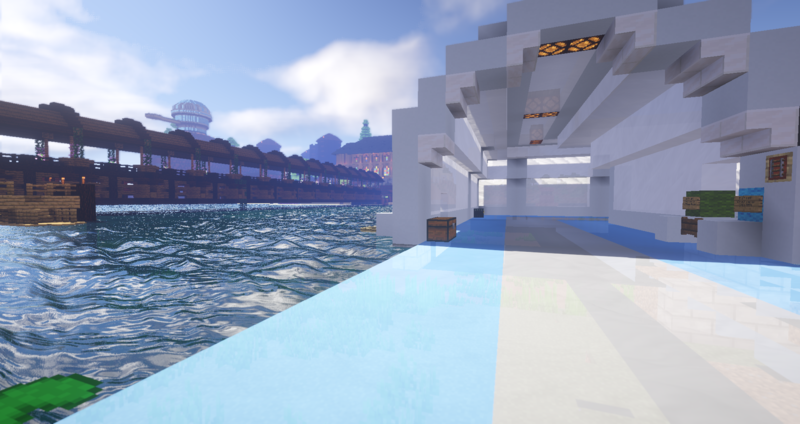 In Beta - release first it had a cobble wall around it which was fine, then there was two weeks where I built it up again in cobble (Still in beta days/late beta) and it looked like an airport hangar. Only to have to do a role-back that would go back 2 weeks and undo it all. Before it's current state there was a wooden hut up there leading into the (Then) upper rear lounge - now the bathroom. The mountain top being safely borded off with oak fencing. For years now it's had the enclosed look with a low brick wall with embedded railings and leaf blocks behind that. The problem was not what that looked like however but more the very flat mountain up to it. I started to dig into the wall and added spruce log supports, embedding the wall back by one - but even then I didn't like the wall looking supported by stilts. If I had done the "stilts" all around it still would have looked funny so I decided to do something very very drastic. 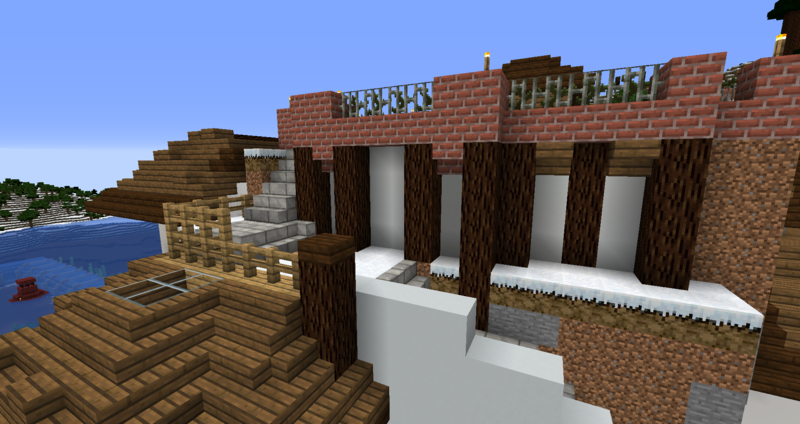 I decided to strip of the leaf, brick and railing blocks; and shave of 1 - 2 blocks of the top and build up walls using concrete. To add to this it would be capped off with a large staggered roof. The two log pillars to the right of the top of the waterfall/balcony have since been removed. Currently there are no plans for what is now a lofty attic, a spare bedroom? - who knows. 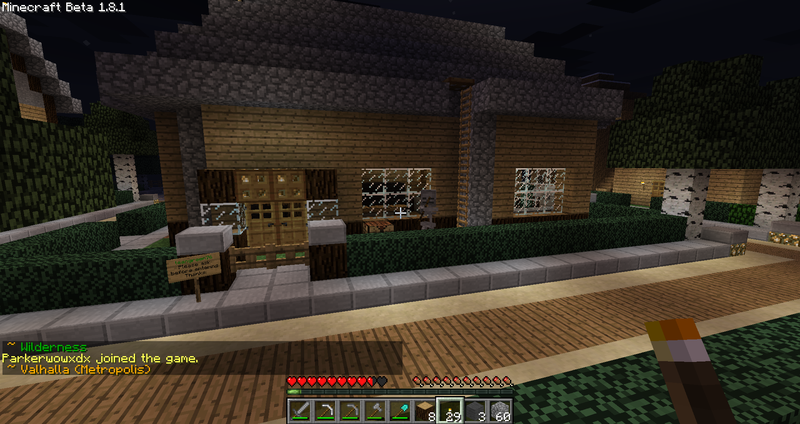 In the far shot you can see windows and shutters were added. 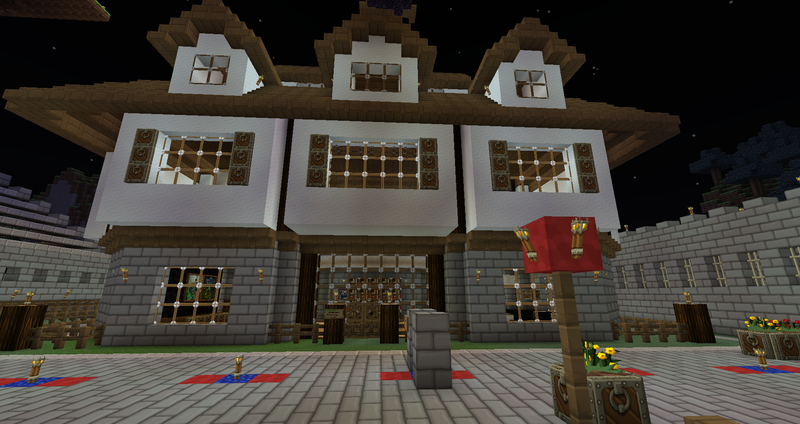 There still needs a lot of detailing to be done especially with dark oak stairs. maybe columns on the outside of the walls for depth..
For a very long time - at least a few years I've been considering a better entrance to the tunnel leading to the horse & donkey barn, I've just never been sure how to do it. Repeated at the other end also. 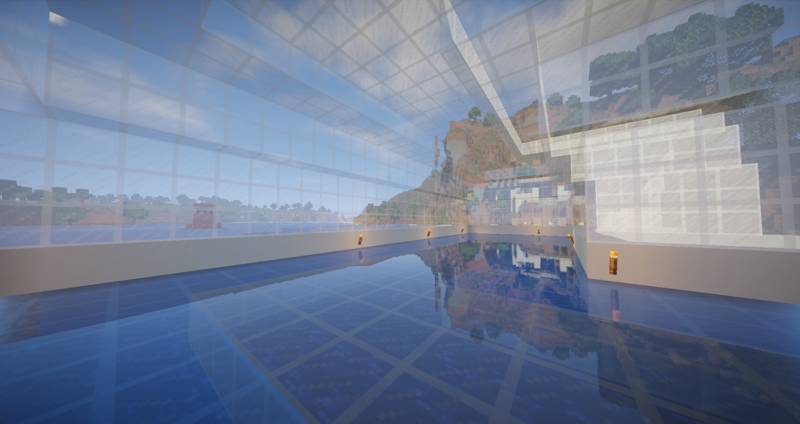 Currently I have just finished the bare bones of another project, project: renovate glass tunnel. 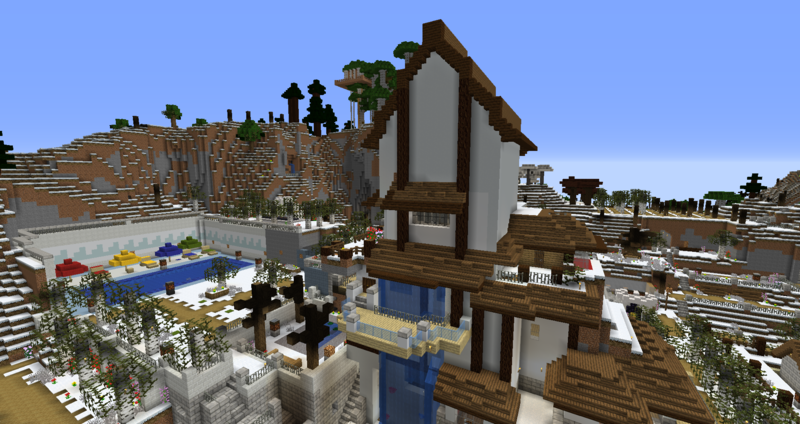 The one by the villager trading hall. I went to my creative copy and added stone-brick stairs to the "Rings" made of stone brick, but still they didn't look good. I tried making them "More circular", it failed. 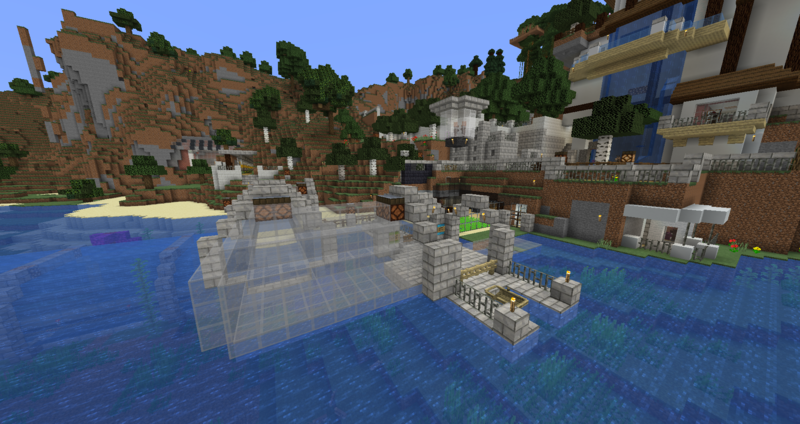 I ended up making a much more half - circular tunnel over all which meant tearing down the entire build. Inside the tunnel will be seating and potted plants. This is far from finished however, there will be concrete overlays over the to of the glass - not all the way round but as stagnated intervals, once I get more white concrete. To achieve this so far, I went to the desert and dug 16 stacks of sand and fired them into glass, I have approximately just 1 & 1/2 stacks of default clear glass left, that's how much glass it took! 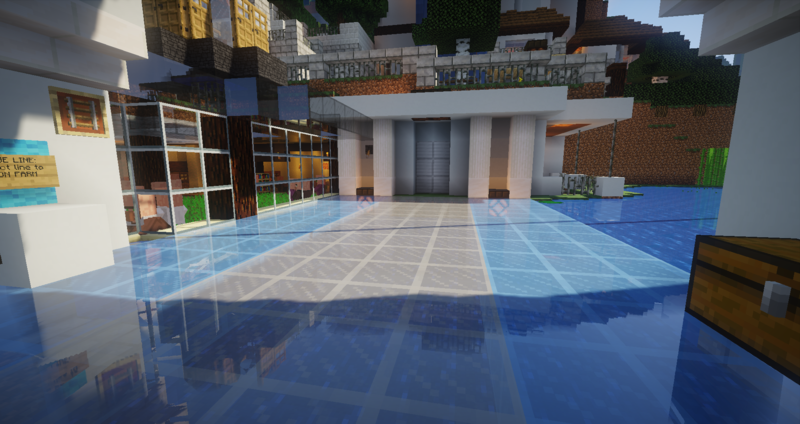 As well as the white glass sides/roof/ there's also the light blue glass floor with a 4 wide light grey glass (Re-used from old build) all the way round! *Extended one side of the observation platform after removal of stairs to mountain top. 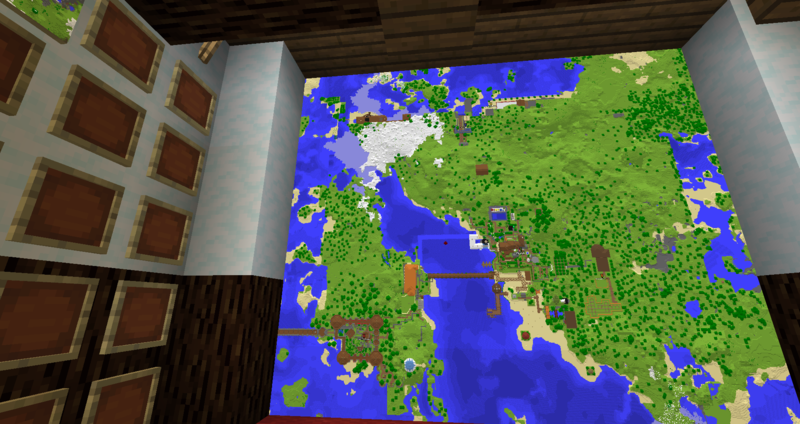 *Re-mapped frames of my world map to include new mountain top roof/extended observation room/observatory look-out and new W.I.P. glass tunnel. 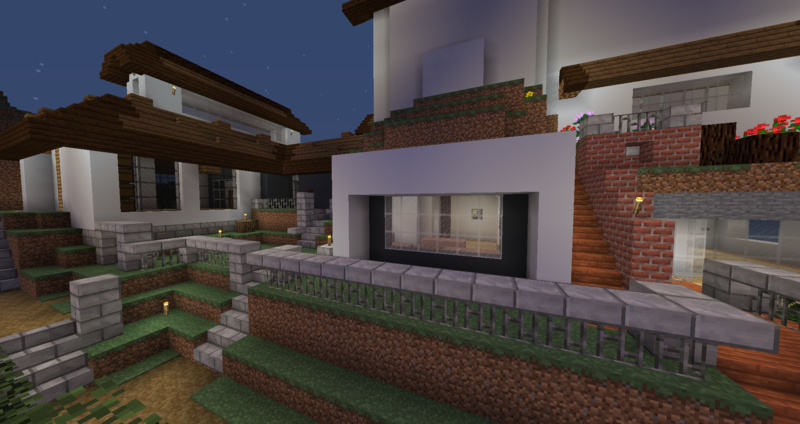 *Changed the outside window to the kitchen area of the V.I.P. room, as it looked pathetic. (More prominent block overhang, inset grey concrete around window. See here. 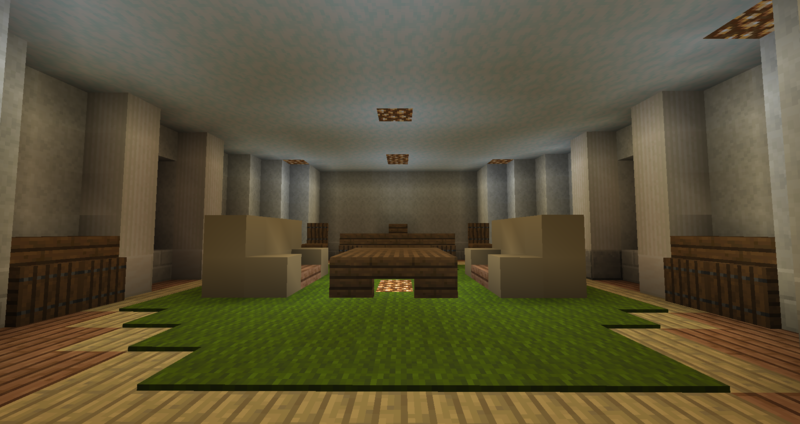 Also added blue banners as curtain to certain windows of main sitting are to re-fresh the room. *Changed all grey wool walls of bedroom to grey concrete. *Moved snow golems to lower chasm (Sealed off from rest of cave beyond walls) in their room so I can have a line of isolated snow golems separated by glass and just shovel underneath them. 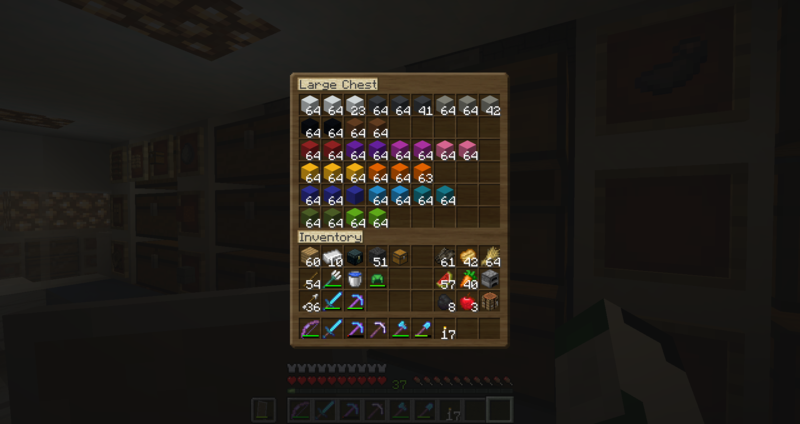 *Traded a respiration III book from my trading hall to add to my diamond helmet. *Now we are in spring officially,. these will be the last screenshots using my winter pack. **There will be no April/easter D/L release this year as I have to feel I've done enough to warrant it. There may be a summer release however. Current location: he Chunk Plaza. Usually when I play I will do a couple of hours then have a break and either do more later or not, lately however I have been having very extra long sessions where I have gotten into a mindset on whatever I'm working on and have just forgotten time! I guess that's never a bad thing though. Continuing with the glass via-link tunnel, I started adding the white concrete to accent the glass (Whilst fighting phantoms at night!) 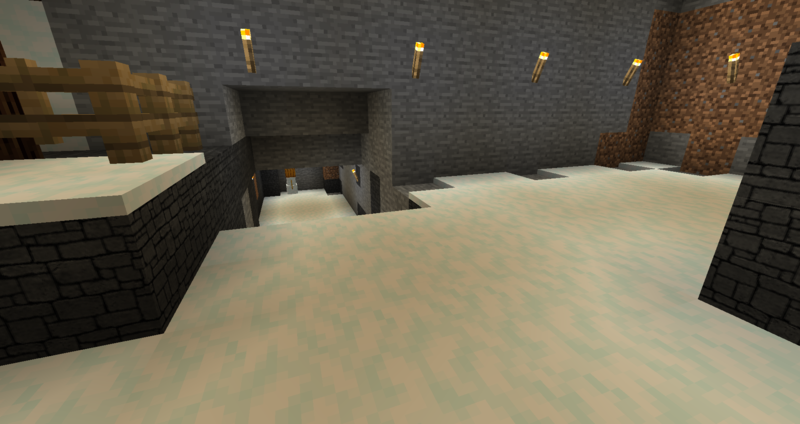 and grabbed as much quartz as I had to add quartz stairs so it's not so blocky. At both entrances and inside the tunnel where the concrete showed. 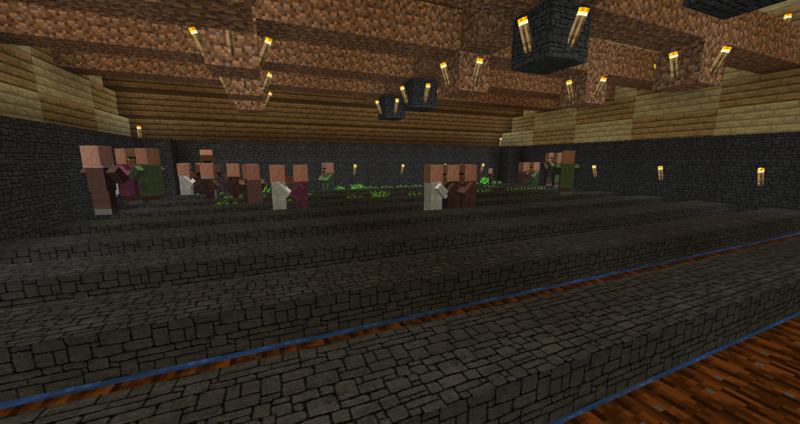 More quartz seating areas will be added once I re-stock on quartz which means another trip to the nether. If you're very eagle eyed you might have noticed from where I took the screenshot in the first picture that something else has changed, hence another reason I need more quartz! With the new wide glass flooring to the tunnel and throughout it, the old exterior entrance to the trading hall didn't line up any more. It wasn't centered, it was also never even more than a passing thought before. 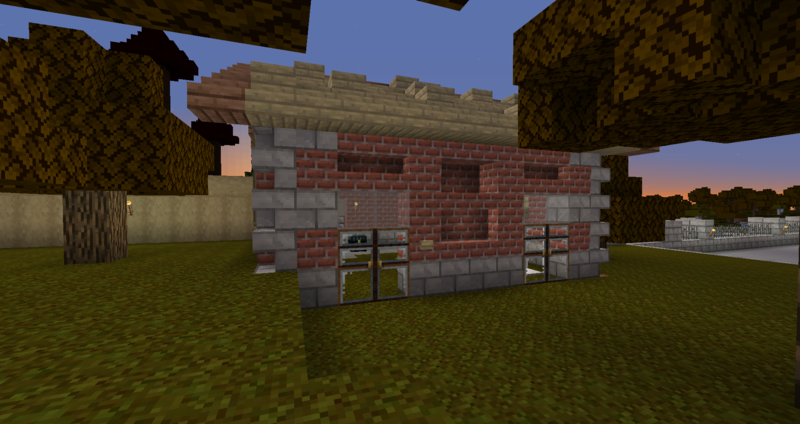 Iron block piston doors. Also because of the over-hang, I raised the other one round the corner leading down to the art gallery up a block so it's all aligned. Due to all the glass used and retained glass from the old build I had to split my glass double chest in storage into two - neutrals and colors. Neutrals being Black, grey, light grey and white and clear (+ panes) and the other being the rest of the colored glass in a separate double chest. 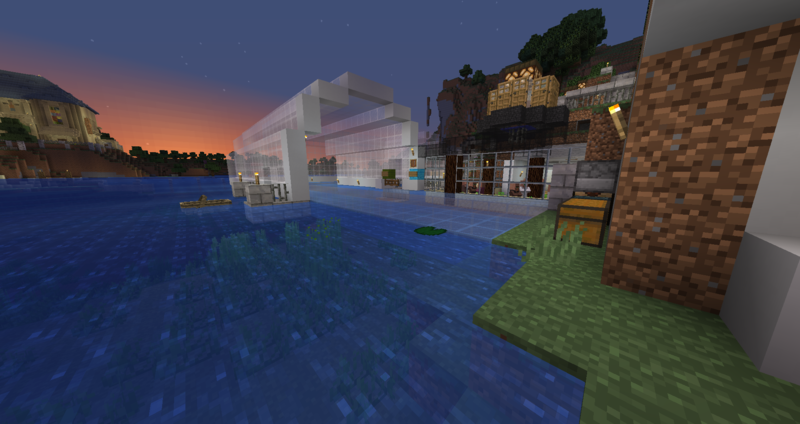 I also cleared my iron farm and started placing iron blocks in the future industrial kitchen at McDunky's at the Chunk Plaza. The other thing I have been considering doing for a very long time is clearing the ice to the right of the ocean. I had a basic silk touch pick with mending - but I needed a little extra.. So I gathered my beacon and then with 50 odd xp levels enchanted a book (Something I've been doing a lot of lately for my armor) and put a high efficiency on a book. I did have to waste a couple of basic efficiencies on stone tools to get it - third time of trying. 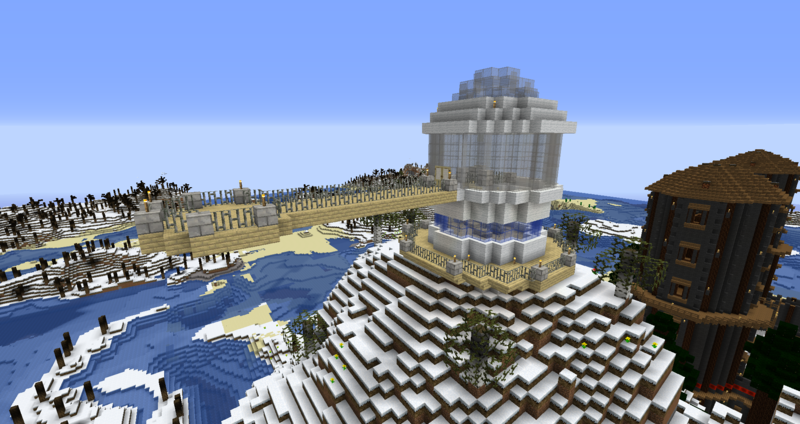 *Bringing back the remains of the old observatory lookout at Look-Out Mountain - aka more glass and a LOT of white wool, I utilized it to complete the entire roof in the library including the extension - there was that much wool. No more stone/dirt ceilings anywhere. (Apart from a very small patch at the very, very back top corner at the very back of the library because I ran out. 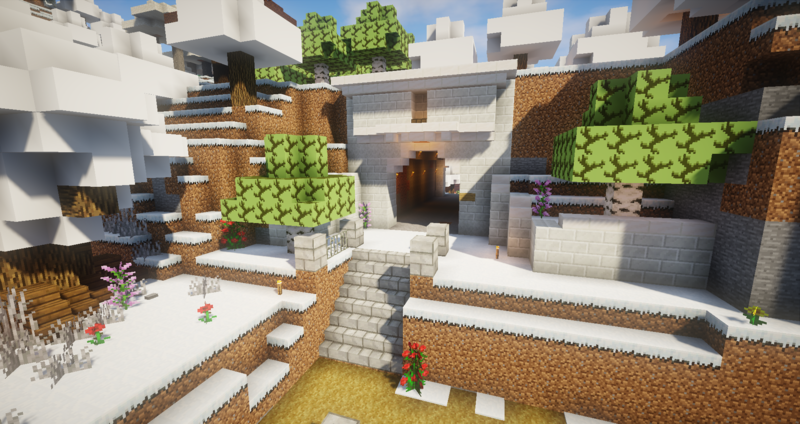 *I also finally changed the dirt/stone ceiling of the seldom seen office into snow blocks like everywhere else, fixed some missing green wool underneath furniture "legs" and fixed up some of the lighting. As seen here. Old basic oak trapdoors were also replaced with spruce ones. 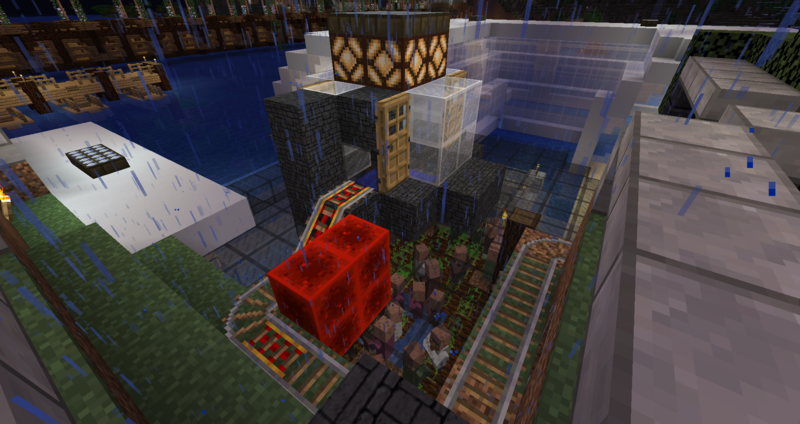 *The melon pumpkin farm was also updated from a very old design to something very Mumbo Jumbo-ish. It's a bit more efficient but I've still kept it small mainly due to space. 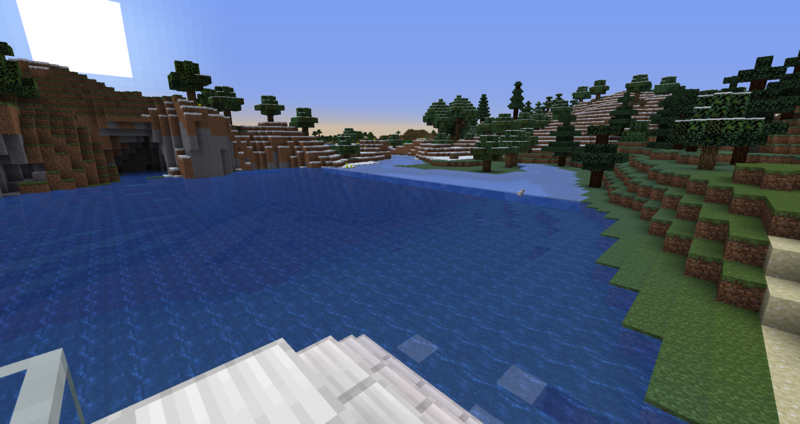 It does however now feed into the mountain and after clearly watching too much of a certain hermit on Hermitcraft, uses a water and ice stream to transport the product all the way back into upper storage! 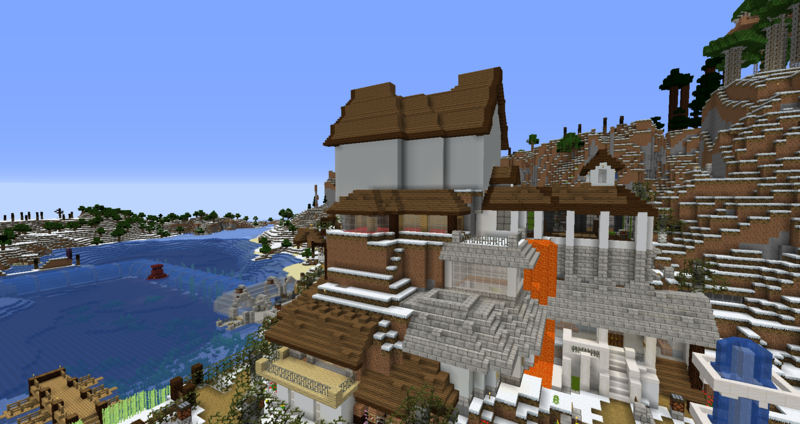 *I also had to spontaneously get rails to return the trapped villagers to the top of the villagers farm. I was breaking glass to give them potatoes and all three escaped. Leading to a rather horrendous night trying get them back in, not get hurt by zombies and fight phantoms! Fun ensued. 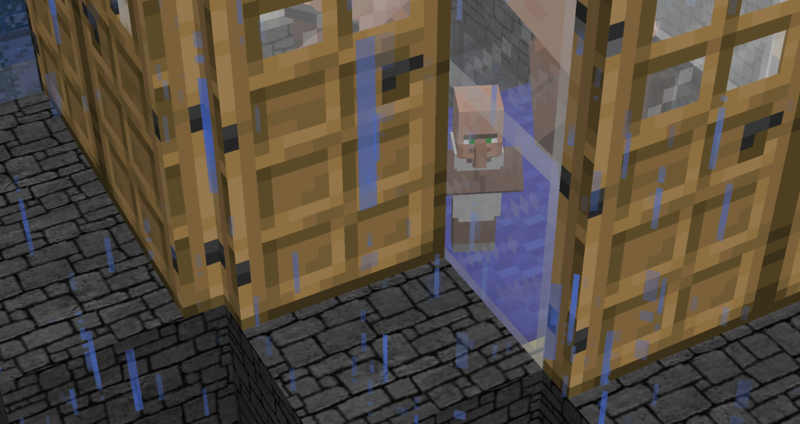 The same three never got back in but did fall back into the villager farm below, so three other ones were transported up. 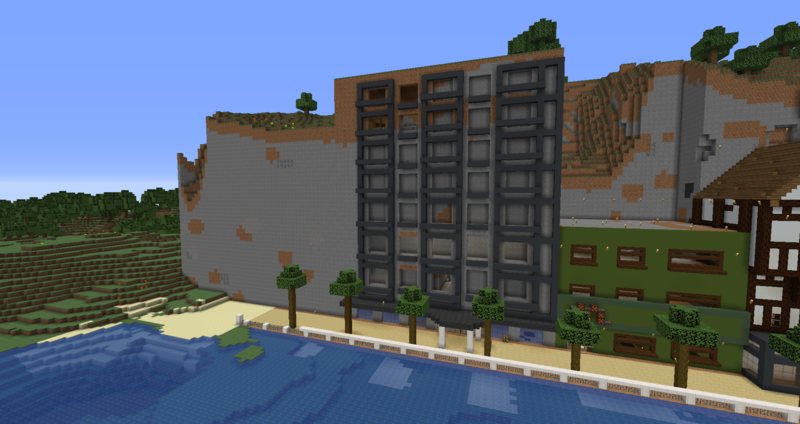 The final exterior Of The Chunk Plaza? To give you an idea, the window placement has changed to begin with. I created window holes with no real idea how I wanted it to look. So they just had a single column of wall between them, where as now they have a three column wall space between each window to allow for the "Girders". First it was to be black girders with an inset color as there was already enough white and red along the plaza, then with the re-think I chose dark grey concrete (After dismissing light grey). With the black girders it was to be a cyan/light blue inset color but I thought it would be too much. When it went to dark grey girders, I'll just say I've chosen an inset color that will really pop. With the new window placement corrected, I will have a girder effect around the windows all the way up for one column, the next will be girder-less but with window sills, then girders again and so on. This was to be the original planned length of the build, but I have since decided that on the bare left side of the remaining chunk wall I will have another column of girder-less windows, then mirror the two columns of ones with girders (With an in-between without) and the very far left side mimicking the two space + column edge on the far right side. 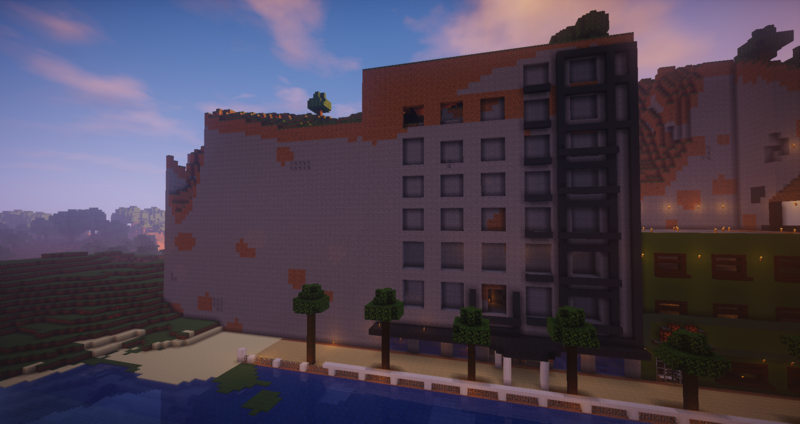 With the the color I have chosen for the inset color, I feel like I am finally making head way on getting the exteriors to the chunk plaza done! This could finally be the final year! For exteriors anyway! Right now I have 3 stacks of dark grey concrete left, a very broken my efficiency pick I need to fix and get some levels as a bonus after my fall from a great height - one of the very top floor windows from a spider through a one hole gap somehow through the wall!! Grrr. It's been a long project - started Dec 2015 into January 2016 then nothing for the rest of the year and then not really picking up again until winter 2017! 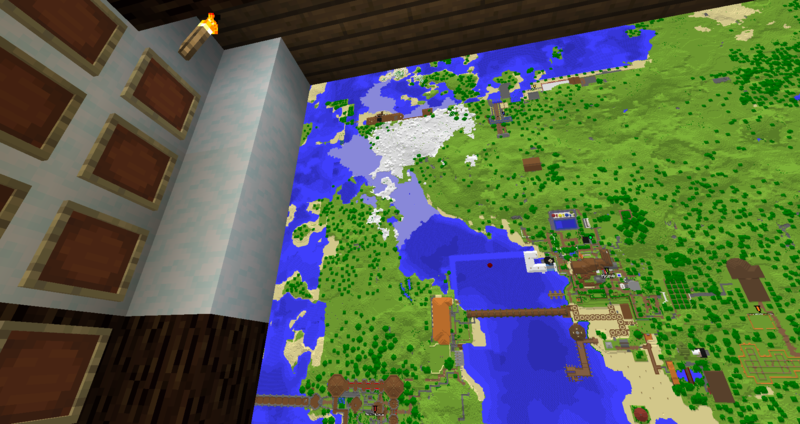 There are other chunk walls but they're further enough away that I don't have to see them, this one has always bugged me. The last time the church got any major update was really when it was converted from a small little church, into the large building we see today. "I always said I needed to add more detail eventually" and I guess that time finally happened. 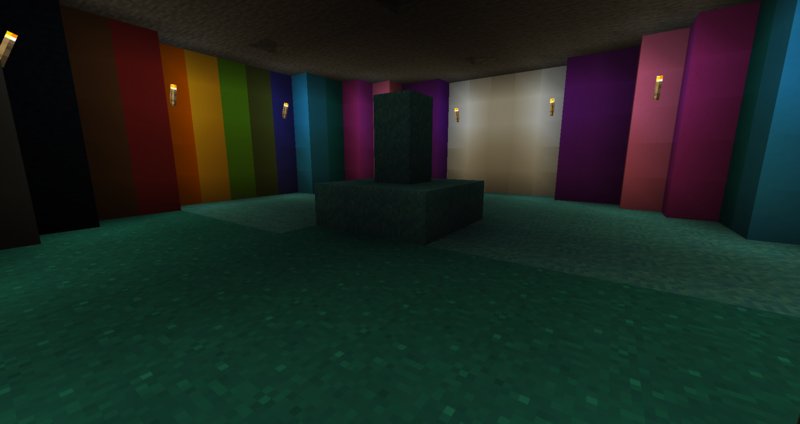 Although I started with the framing the outside stained glass windows, what actually spurned this mini-project was wanting to build out around the altar inside. At the moment I have a temporary birch tree farm right in front of the church, just so I have it on site directly next to the building as I need a LOT of it! 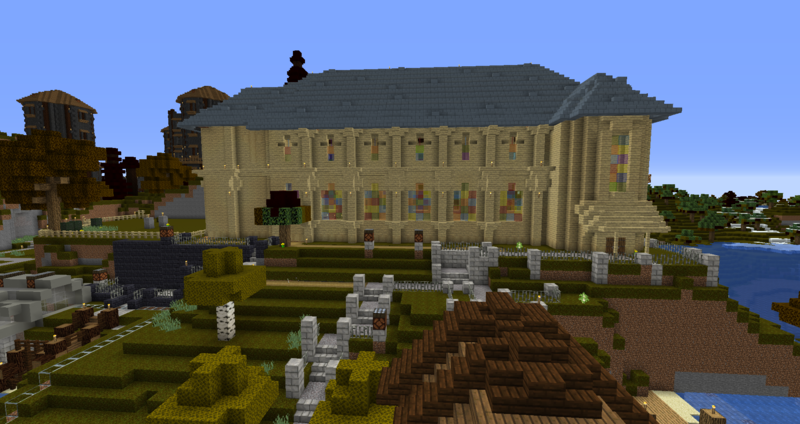 Currently I have been working on the inside windows, but I also need to do the ones round the back. On to the altar, and you'll see from the first picture, how the rebuild altar (When the building was expanded) looks very lonely on it's own. 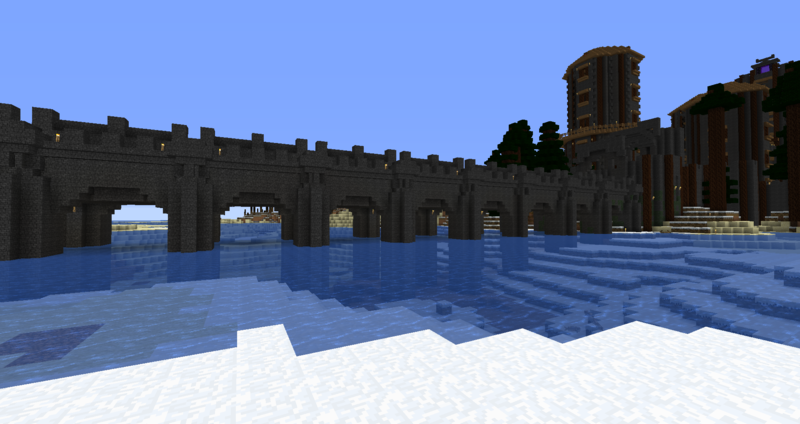 So I wanted to surrounded it with some columns and arches. More shapes than arches, still needs work. The use of alternating blocks was an after thought after the initial build when it was just "Too much birch" so I threw some sandstone & variants + stripped birch logs into the mix to vary it. 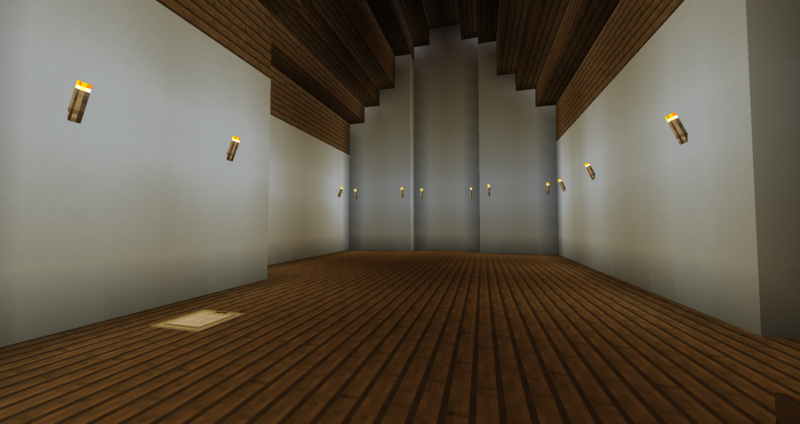 I will also be considering lighting and redoing it so it looks less "Torch spammy" with more possible glowstone in the walk way up to the altar covered by an iron trapdoor so it blends in and light still shines through the holes. 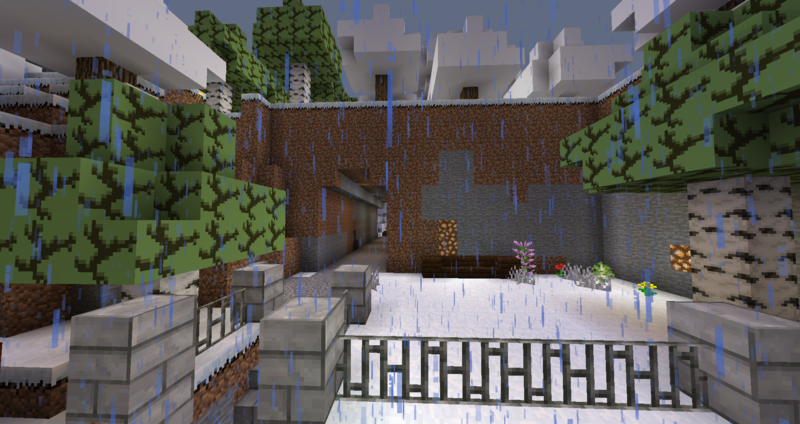 Another project that wasn't planned but found itself, was the entrance to the main minecart ride to the Chunk Plaza station. Remember when I dug the alternate parallel tunnel towards it and created that nice glass & concrete canopy on the outside of the mountain? It was time to change this old outdated entrance and mimic & incorporate the canopy of last years buildwith a bit of added concrete/glass struts at the entrance. 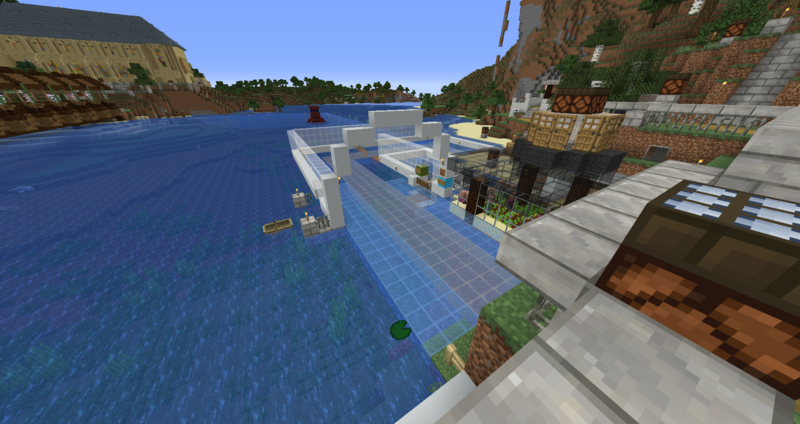 We're going back to the days of when the first underwater minecart tunnel went directly underneath the bridge and then underground by the church, taking the original line from over the top of the low mountain (follow the shoreline), by Mount DOOOooom to beneath it. This glass "In the mountain" either side has remained untouched for many years! I knew one day it would change,from 2015 onwards it always bugged me when I passed this way. I had to widen the tunnel here before doing the canopy, just a little as that would be "Phase B"
This is why I needed the dark grey concrete as the canopies color gets progressively darker towards Mount DOOOooom. Dark grey accent on one side then black on the other directly by DOOOOooom. As mentioned in the last lot of screenshots, this is what I'm also currently working on, the tunnel widths are inconsistent due to age and time it was built. Parts are 5 wide but at bends and corners it goes to just three and stays that way in the last stretch to DOOOooom. So I wanted to make it all consistently 5 wide across the board (Hence the title!) Digging out the walls where needed was easy and I had the coarse dirt already at DOOOooom to lay underneath the tracks from St Primus station to DOOOooom when I relayed/realigned them following the widening of the tunnel. I have also re-done the red wool strip from the areas mentioned and stone-bricked up the top half of the tunnel again. 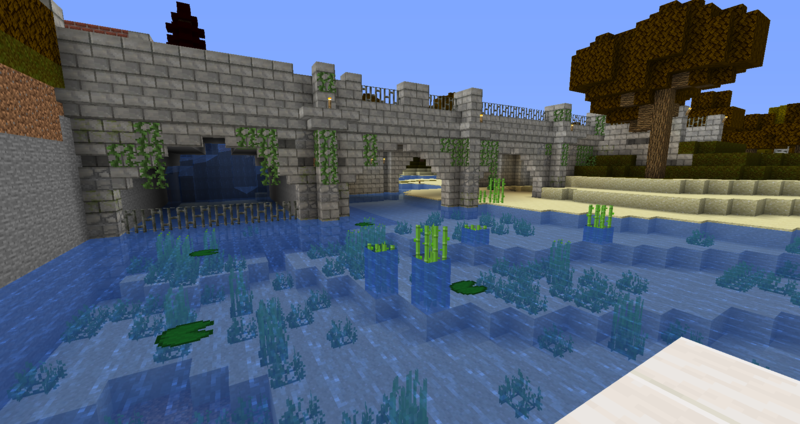 I shall e using a different block for the low walls and looking to see how I can also improve things. 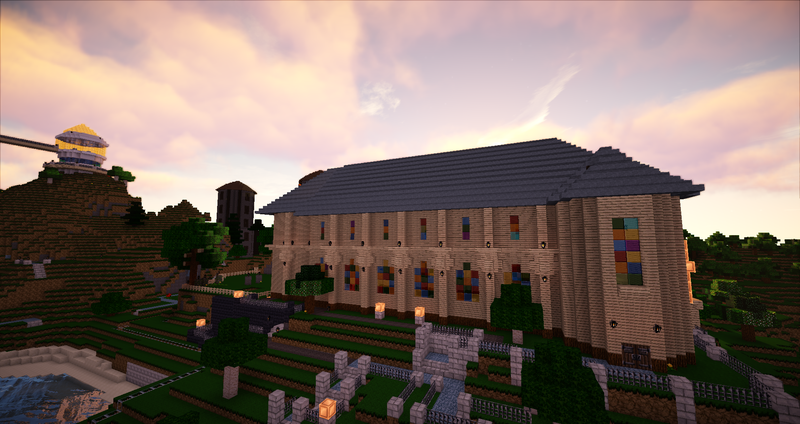 Eventually from the new dark grey canopy back to the church, the sky lights (Which also need to be re-aligned) will change to green glass blocks to blend into the grass up top. So I have been a busy boy! *All maps updated, main and one at Mount DOOOoom - to account for new canopy, DOOOooom's needed a lot of updating for the new canopies, the new glass tunnel link back home, the huge mountain top roof now and the new observatory lookout point in recent months. 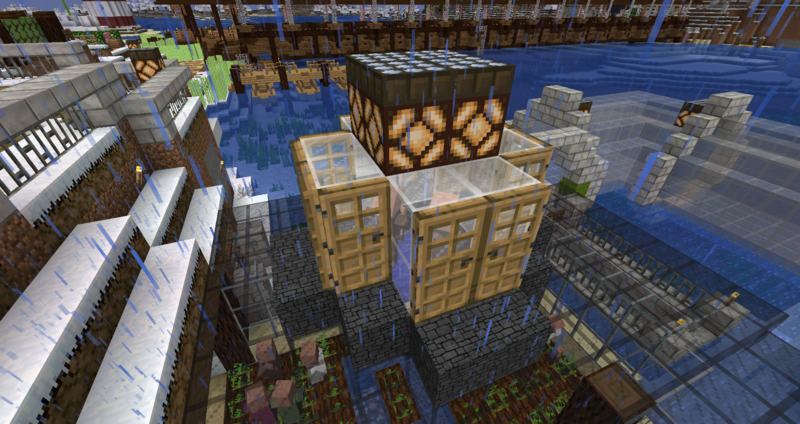 *The pumpkin/melon farm is double stacked up, currently now with two rows. 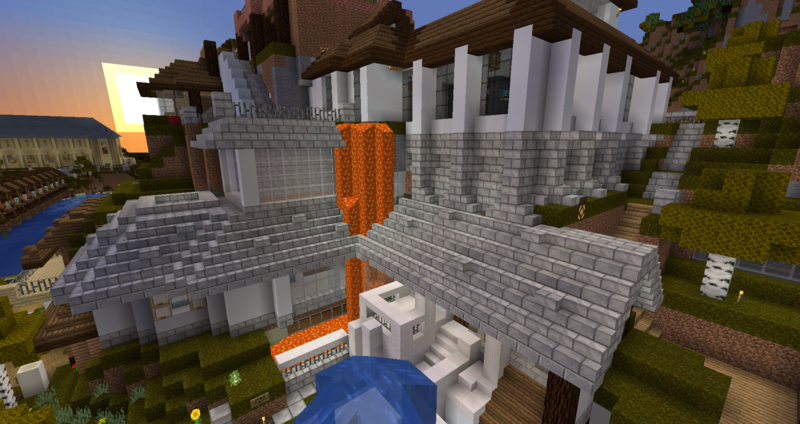 *Repair work done to a balcony at Mount DOOOooom after using a creative copy of the world for snapshots and noticing it whilst taking screenshots at the back of DOOOooom (nostalgia). Not sure if it was a creeper of lightening but there was a big hole in the balcony which is now fixed. The next update - won't be an update. It will be some news however, on May 10th!